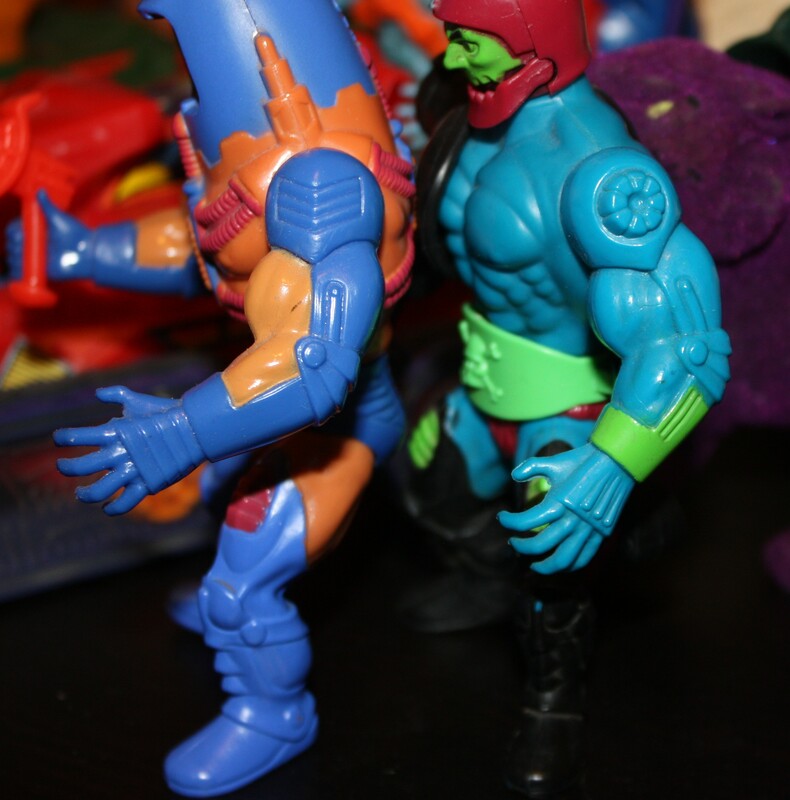 Trap Jaw was kind of the holy grail of MOTU figures among my friends growing up, and it’s easy to see why. 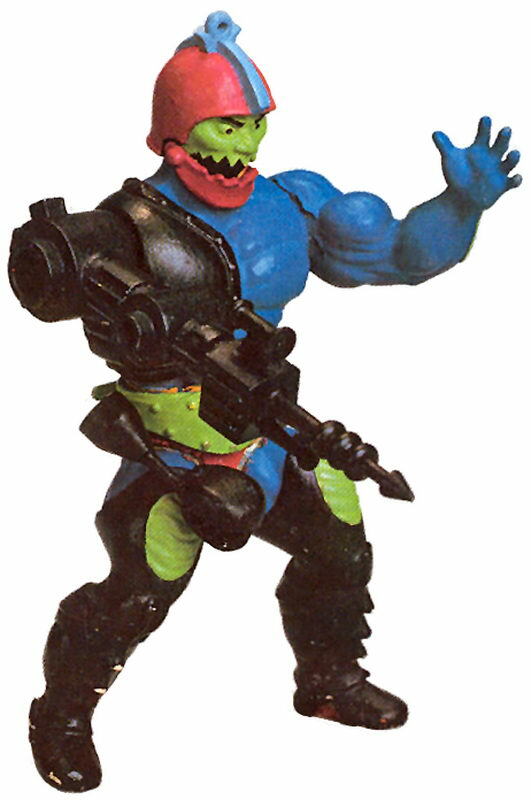 With his three weapons attachments (storable on his WWF-style belt), articulated jaw, loop for repelling and vivid and liberally applied colors, Trap Jaw was truly a deluxe figure. 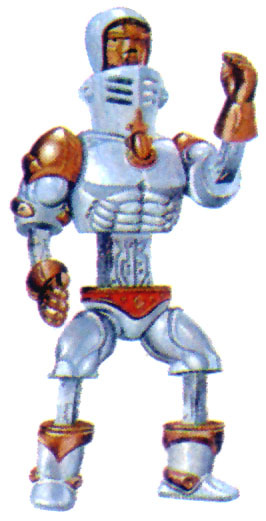 Sadly, I never owned old Metal Mouth as a kid, but I have a very clear memory of playing with my friend’s figure. 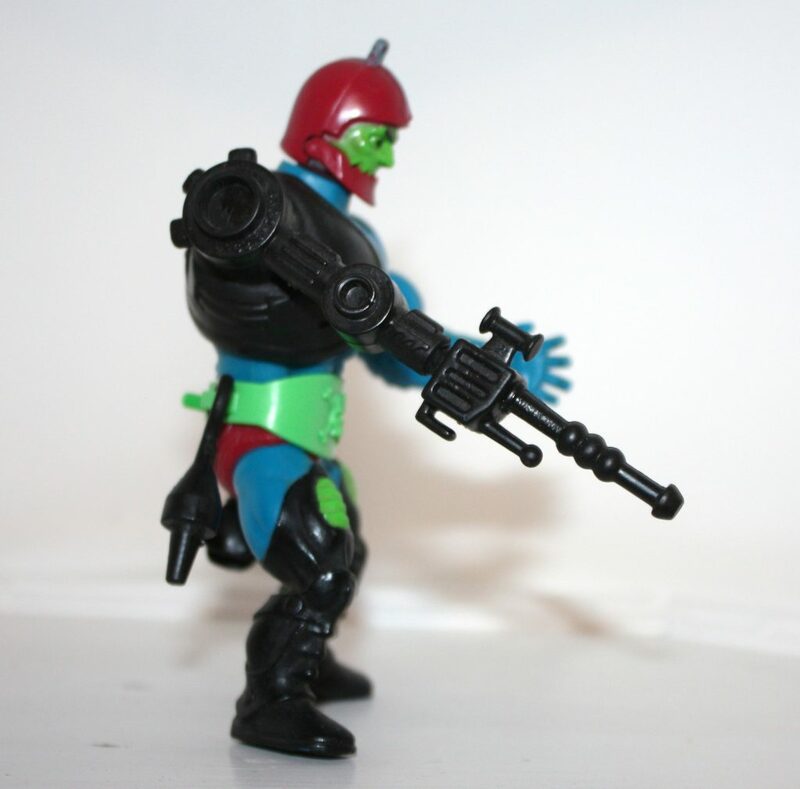 The first thing I did was make Trap Jaw get to work on chewing up every weapon in sight. 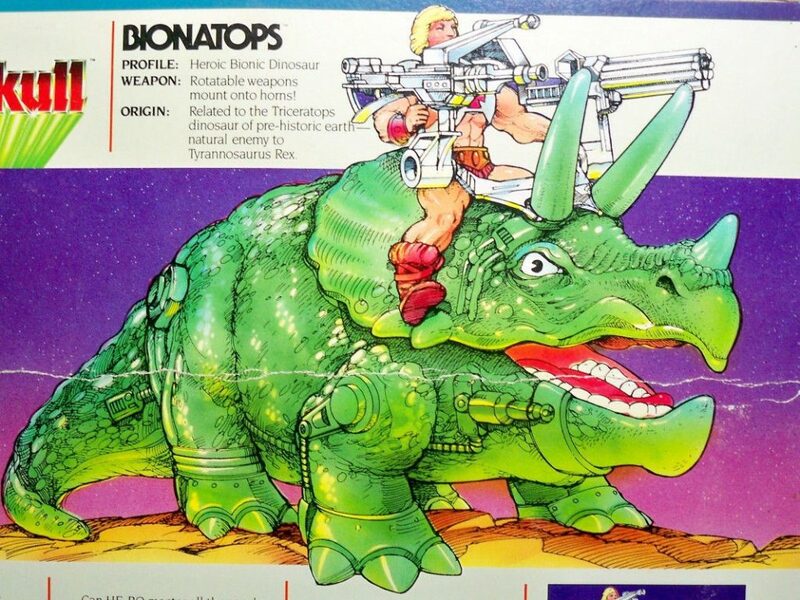 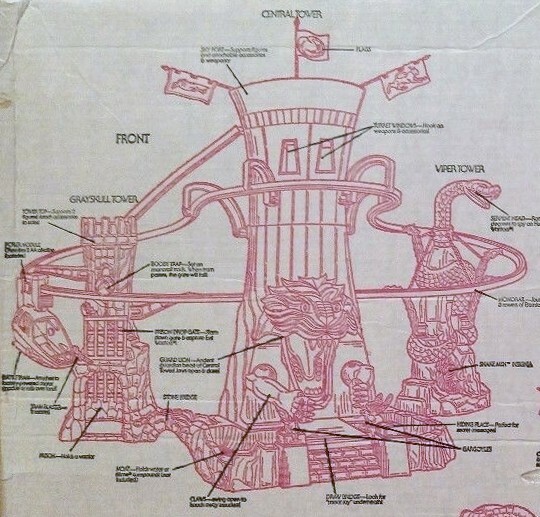 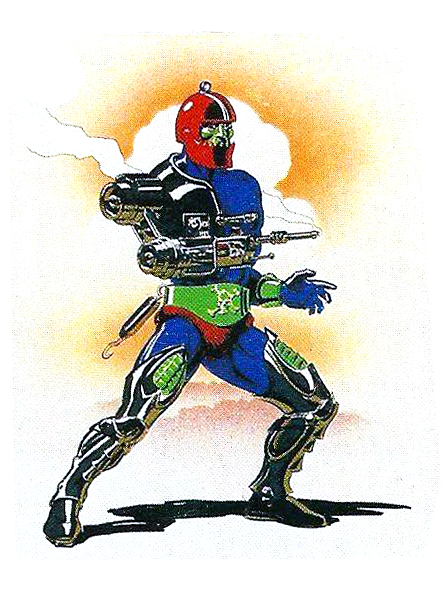 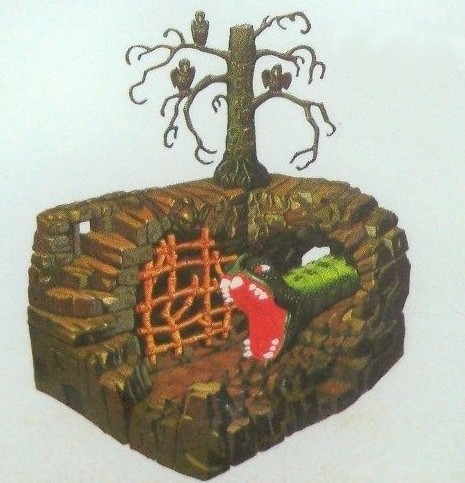 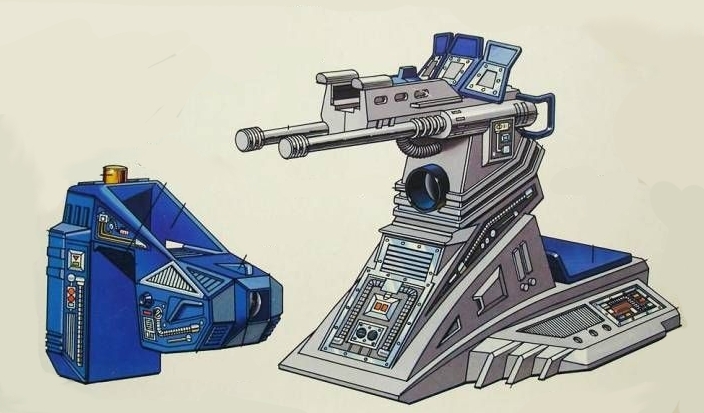 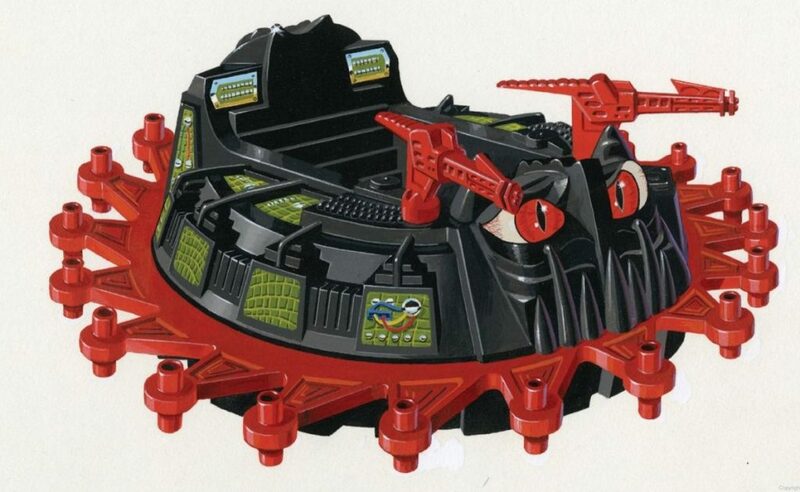 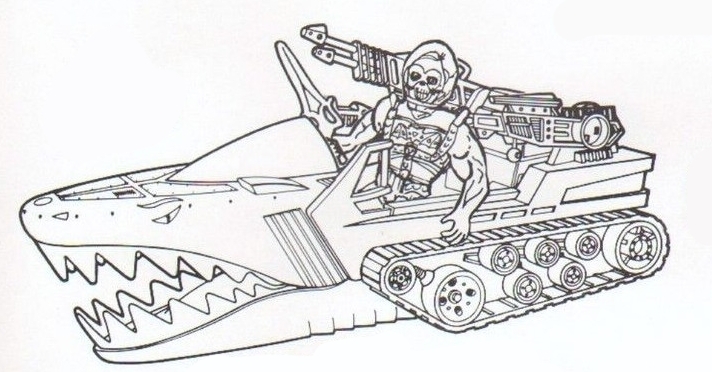 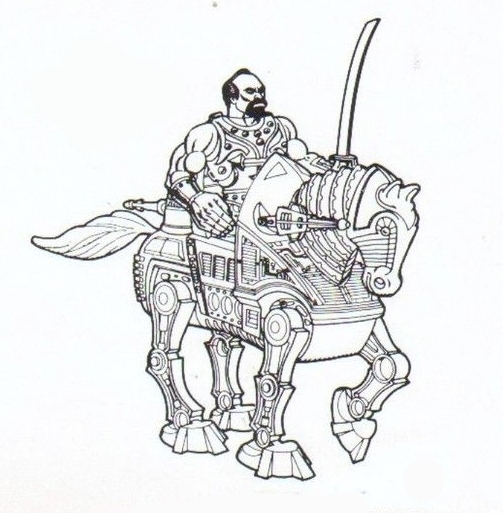 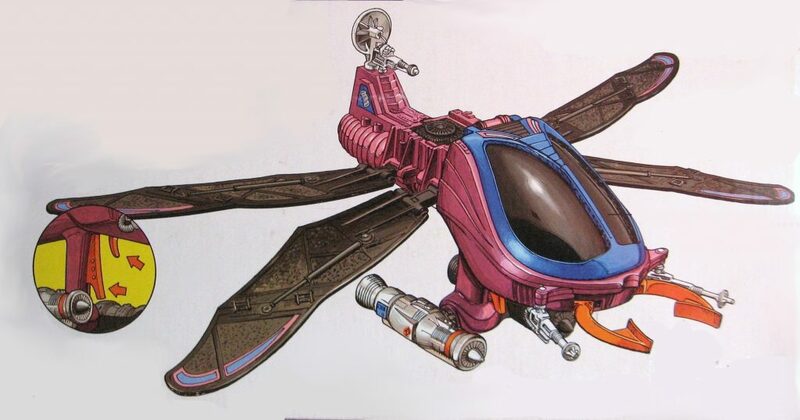 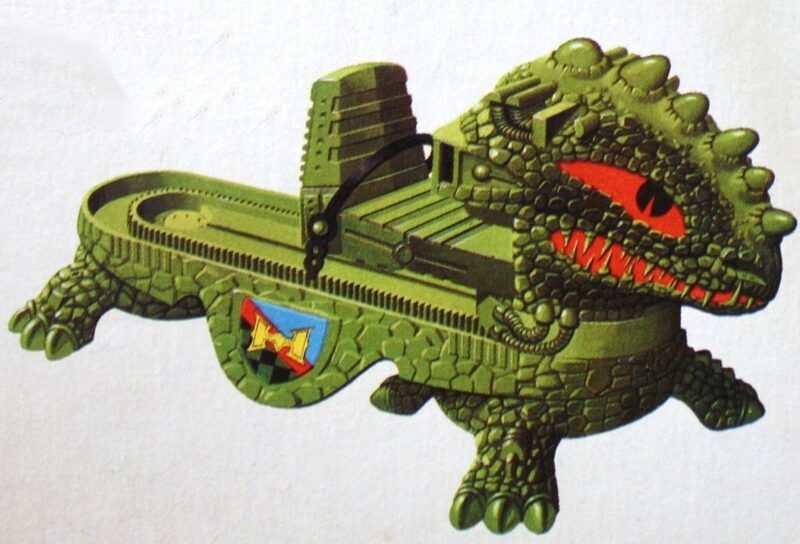 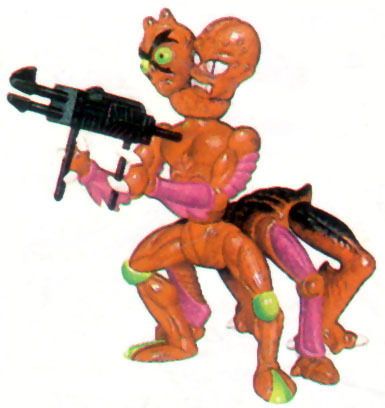 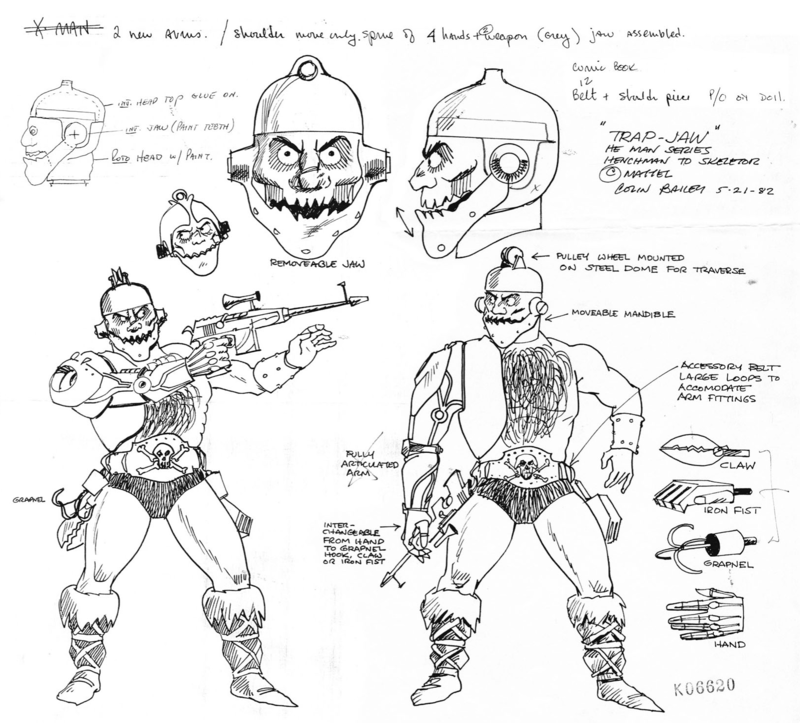 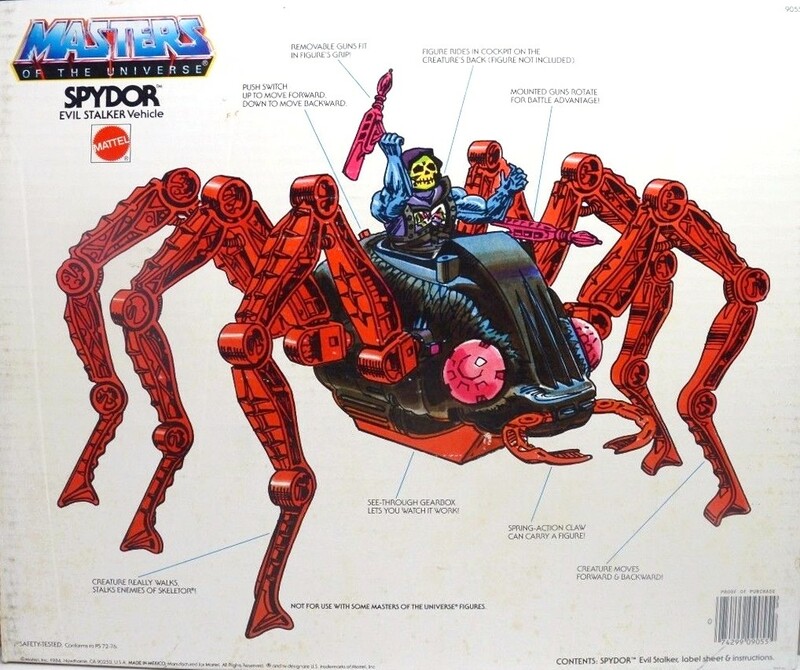 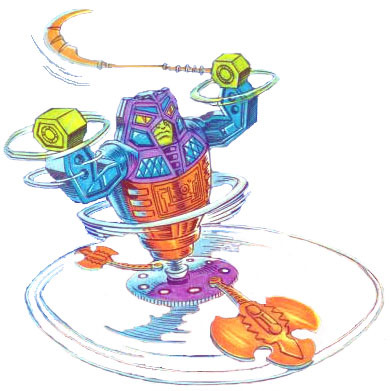 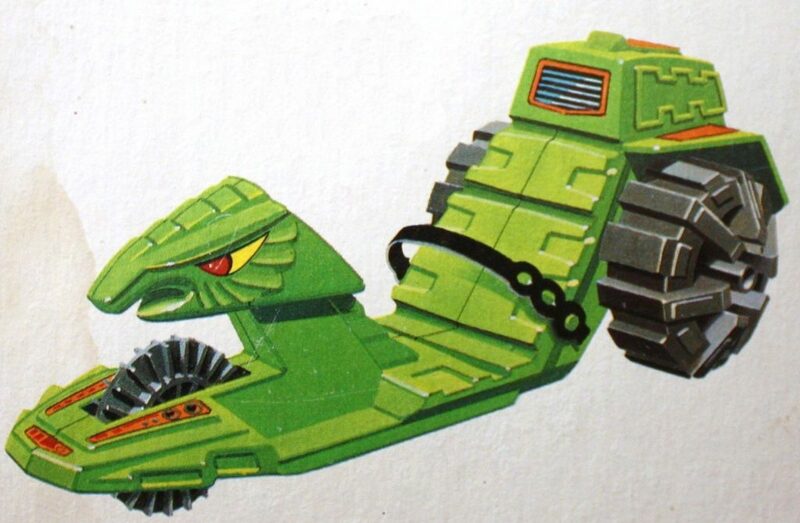 In a May 21, 1982 concept drawing by Mattel designer Colin Bailey, we see the first iteration of Trap Jaw’s design. 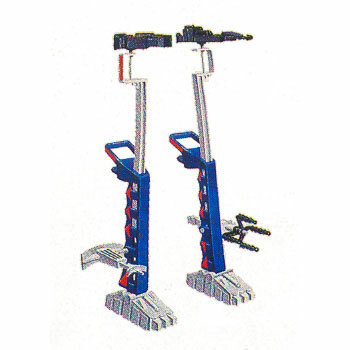 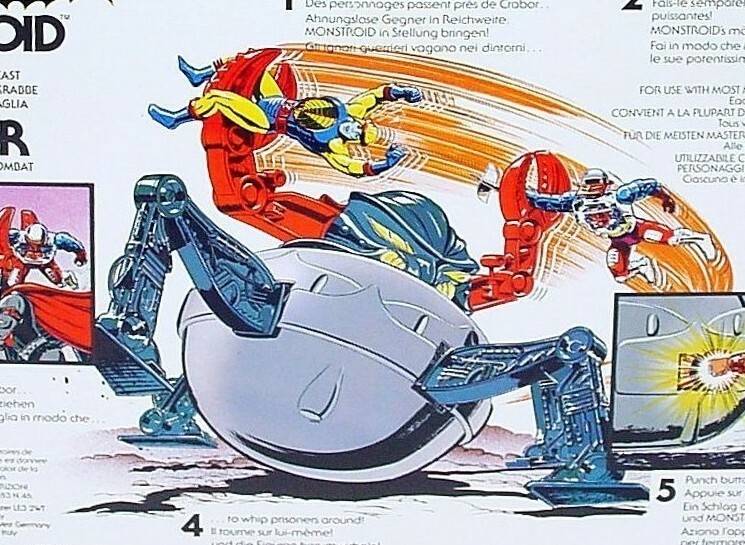 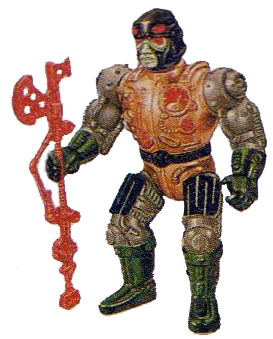 Called “X-Man” at the time (it’s easy to figure out why that name was dropped), the design featured the articulated jaw, a pulley on the top of the helmet, a fully articulated robot arm with four attachments (claw, iron fist, grapnel and hand) and accessory belt, and a rifle that could be held in the robotic hand. 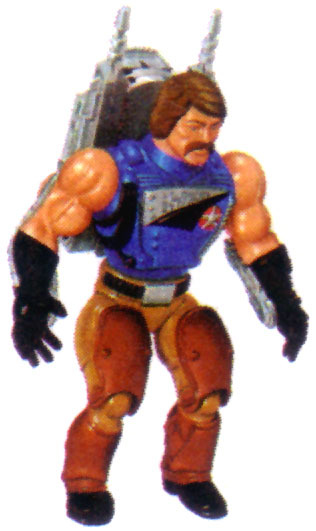 X-Man had a hairy chest and a human-looking left arm. 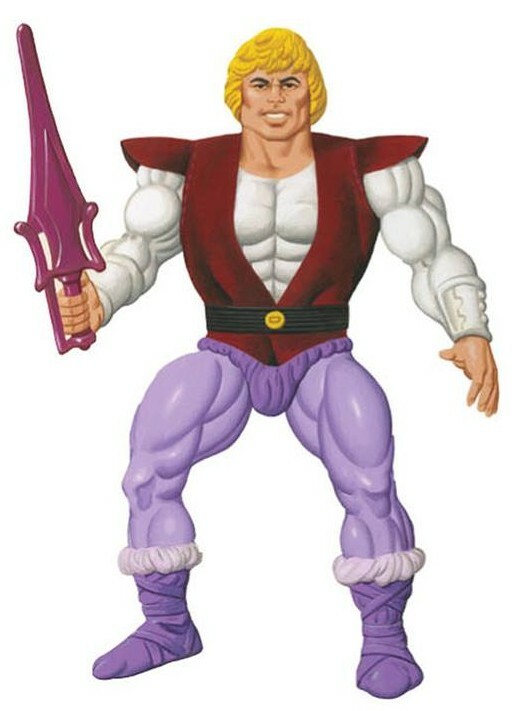 He also would have used the same legs as He-Man. 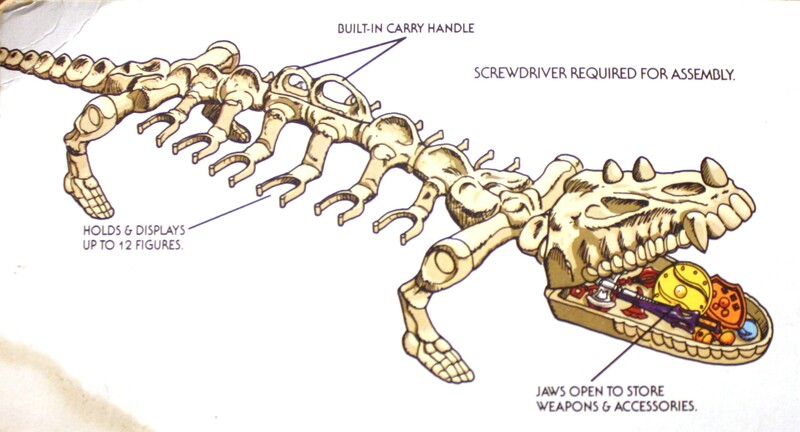 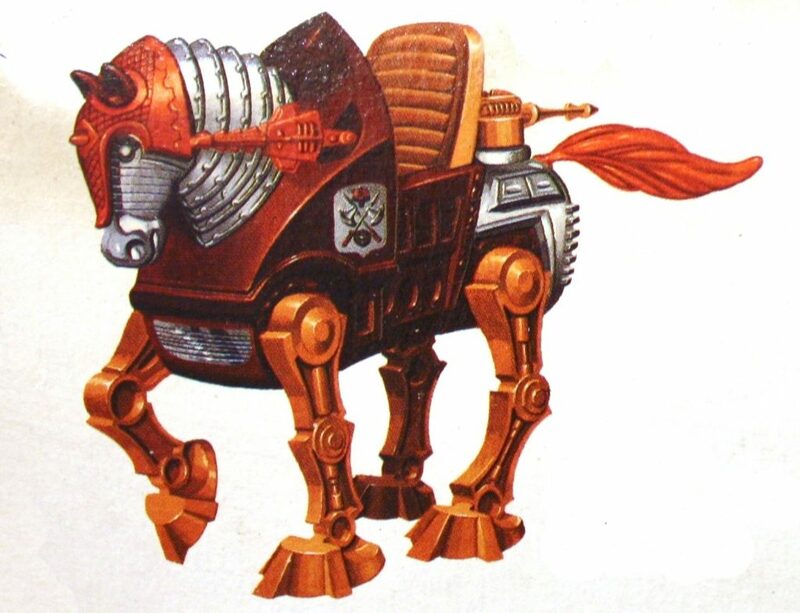 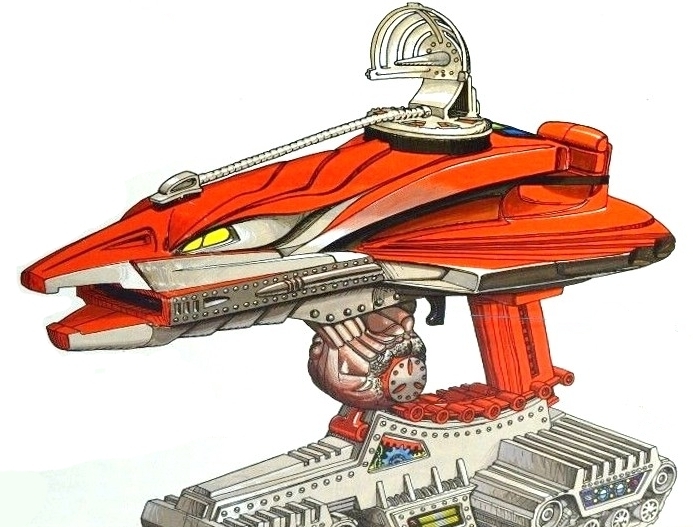 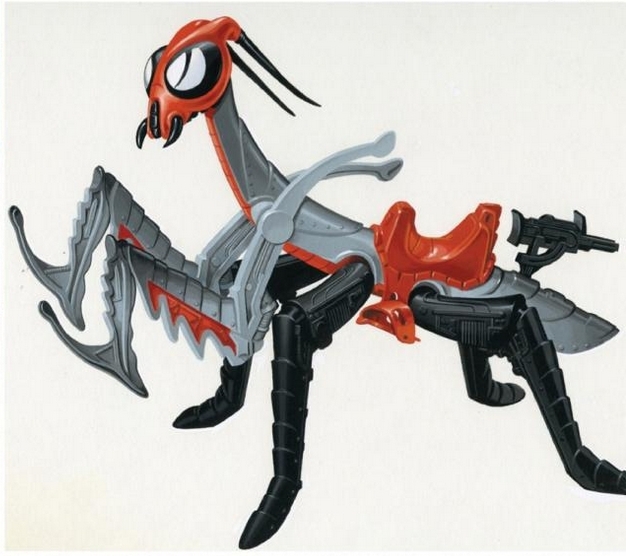 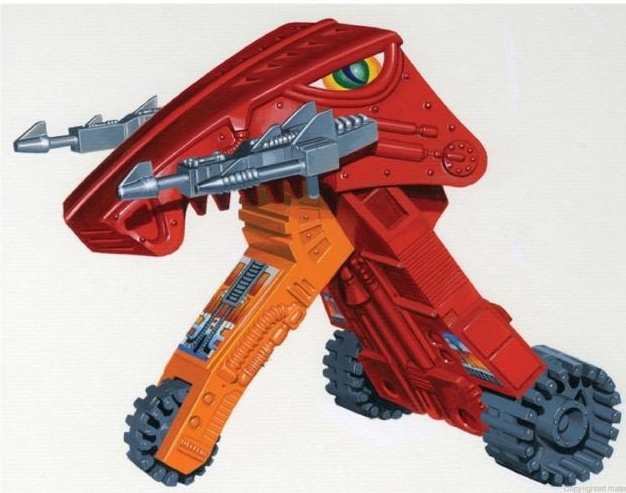 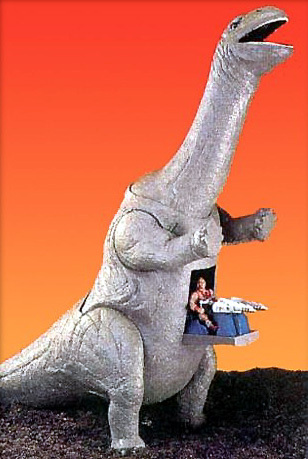 The articulated jaw concept was apparently recycled from an unproduced 1982 Big Jim concept, Iron Jaw. 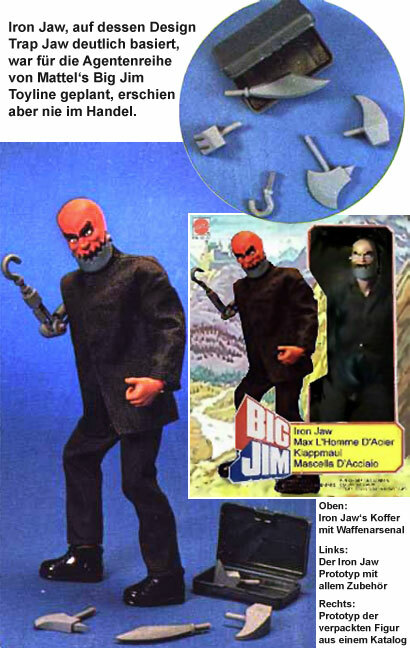 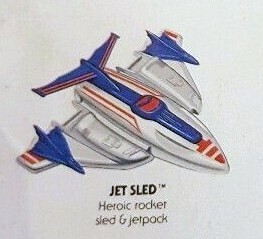 It also recalled the villain “Jaws” from the James Bond film Moonraker, crossed with a pirate. 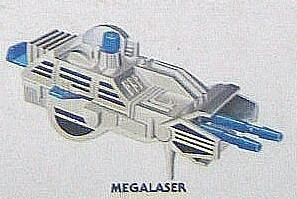 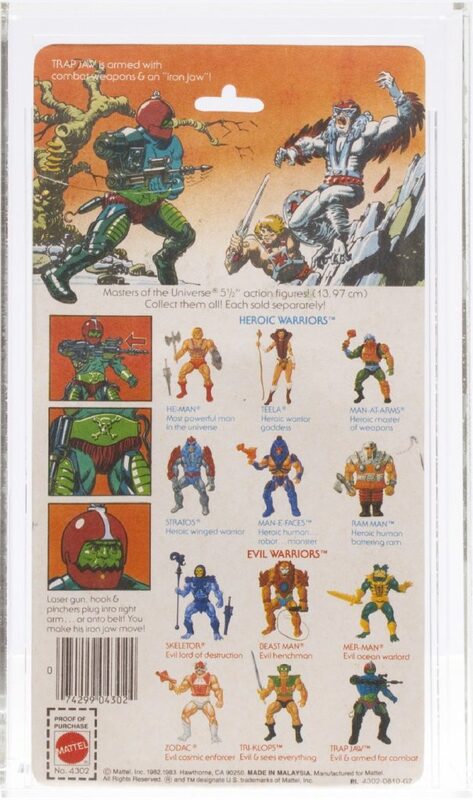 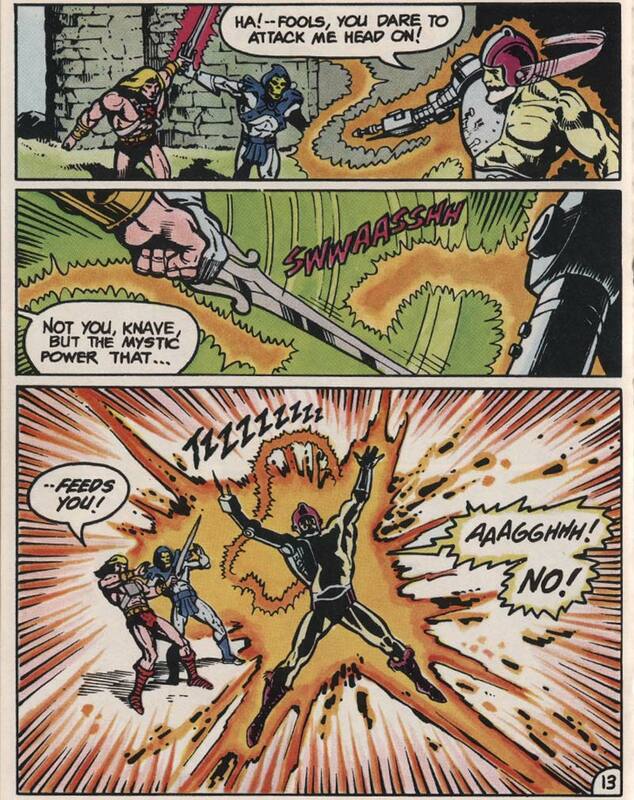 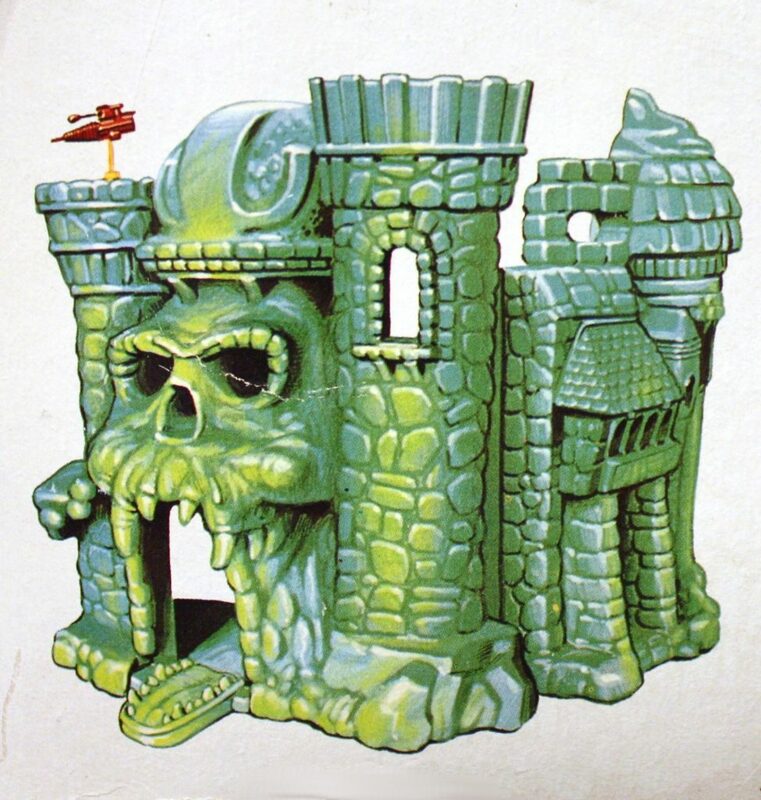 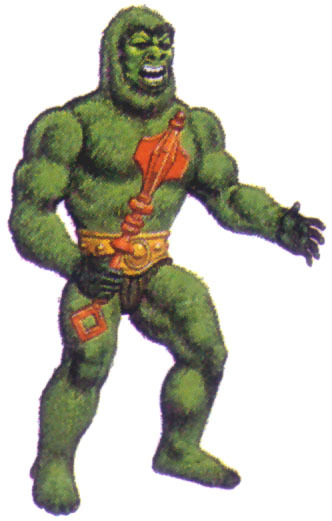 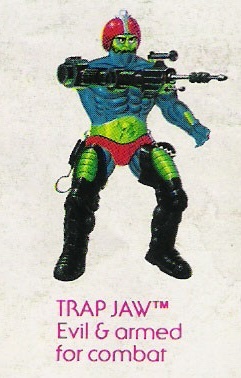 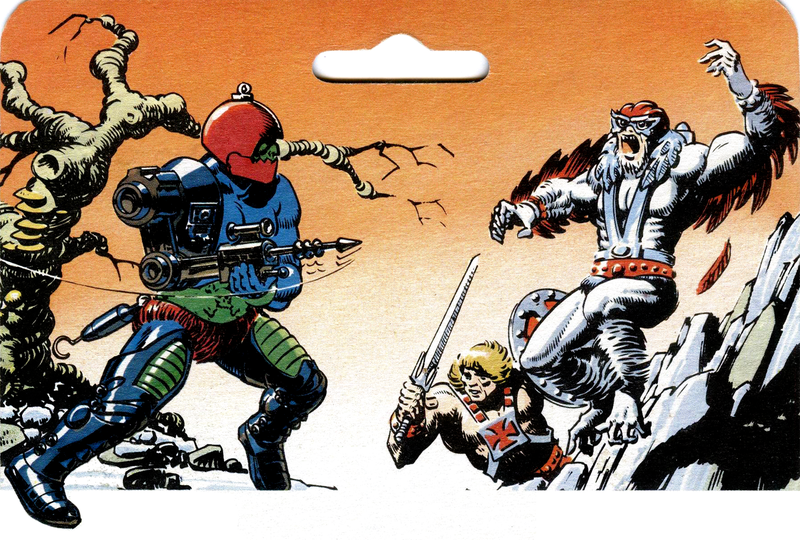 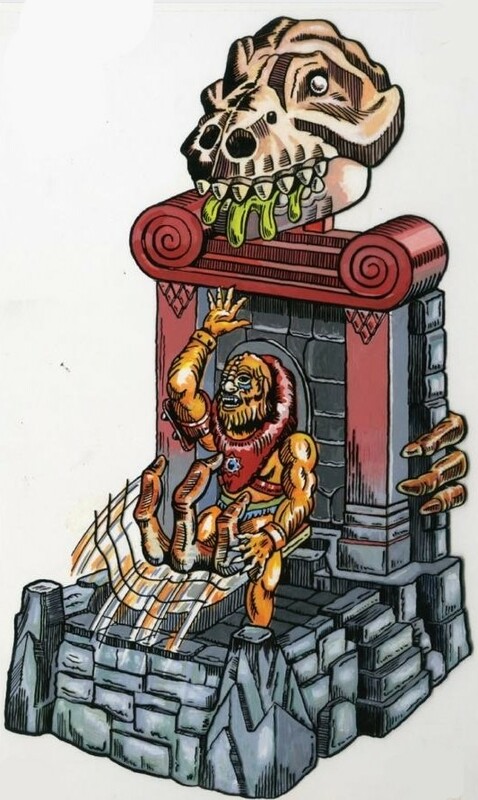 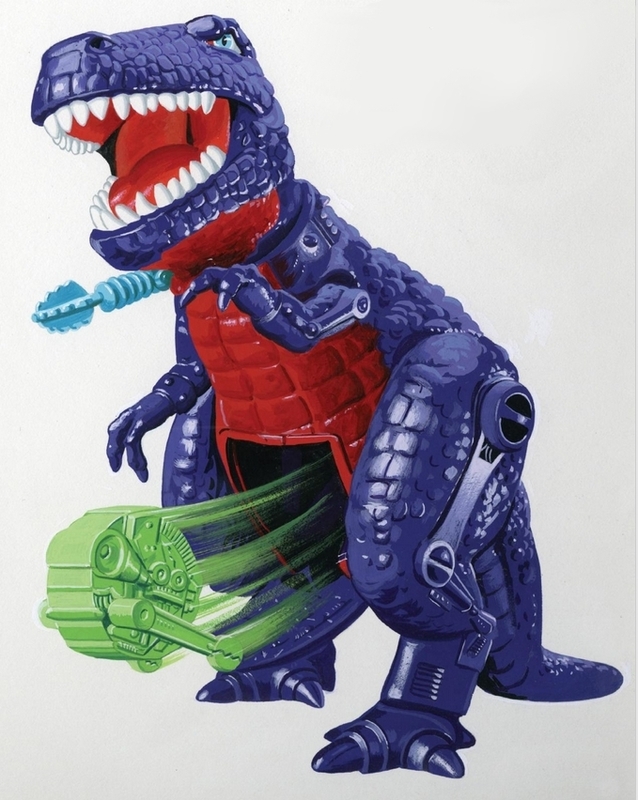 This early concept appeared in full color in the mini comic, The Menace of Trap Jaw, which came packaged with the figure. 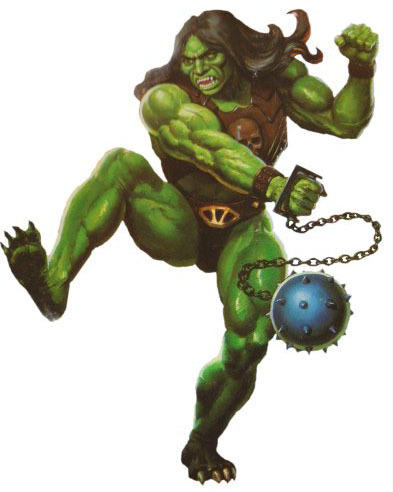 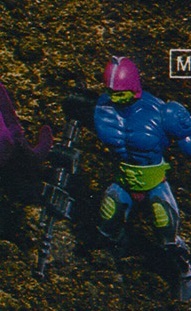 From the comic, it’s evident that Trap Jaw was originally intended to have pale green skin and maroon trunks, boots and helmet. 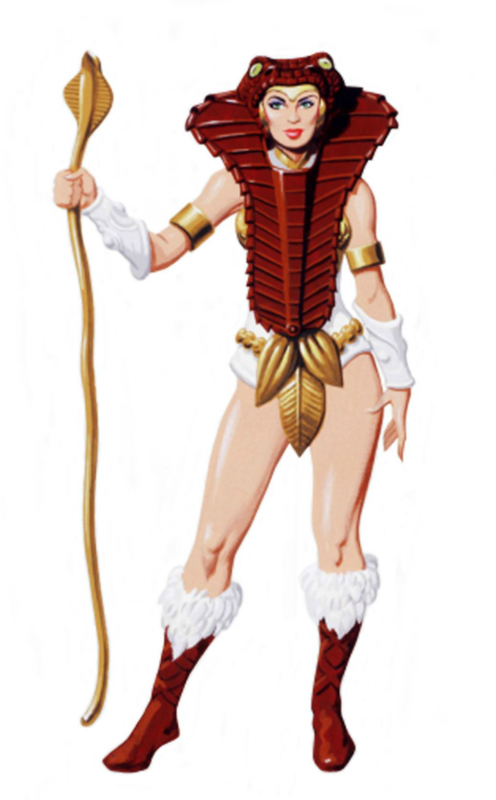 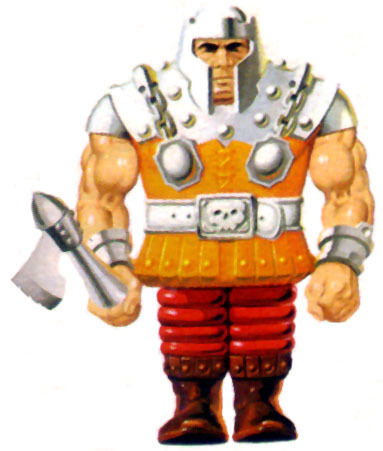 His arm is a bit squared off compared to Colin Bailey’s concept drawing, and his belt features a ram’s skull rather than a human skull and cross bones, but otherwise the design is identical. 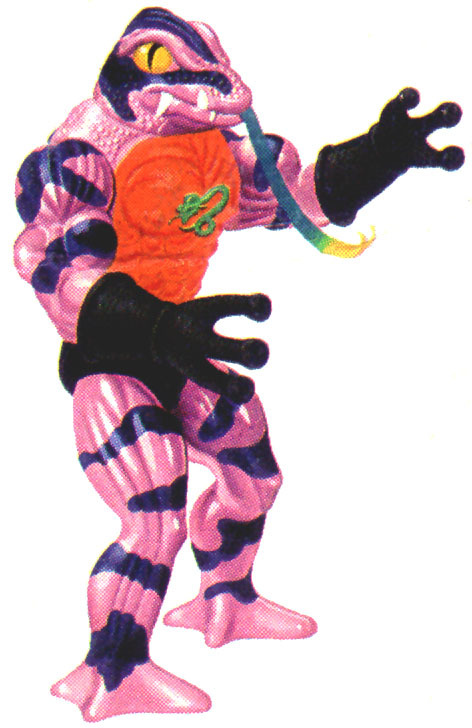 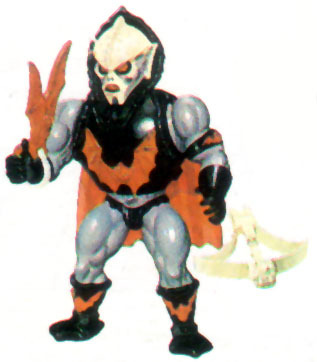 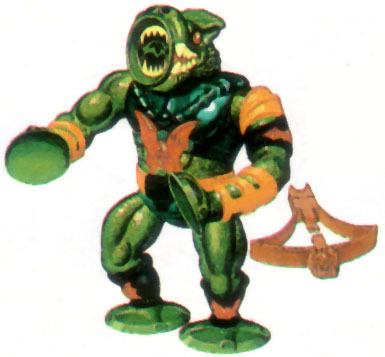 As we see in the prototype shown below, Trap Jaw’s colors were significantly altered later in his design process. 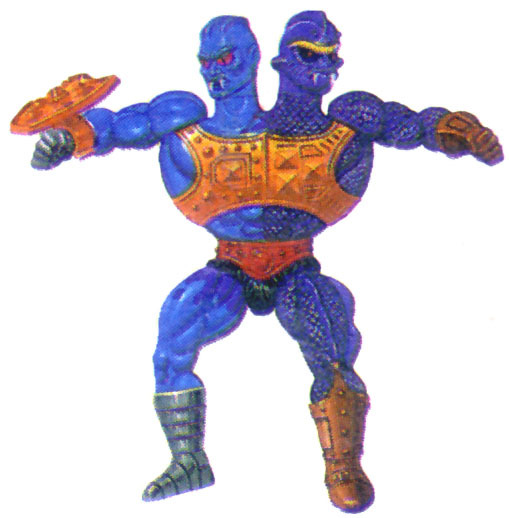 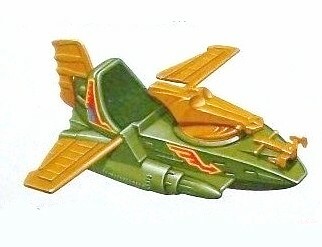 While he retained his green face, the rest of his skin was changed to a rich blue color, and his attachments and accessories were changed to either black, maroon or green. 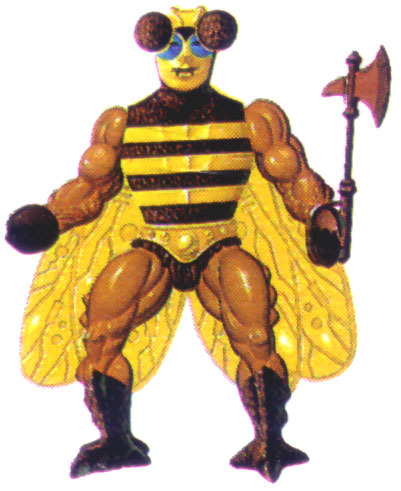 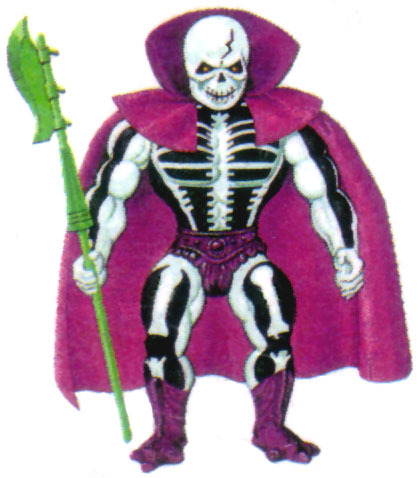 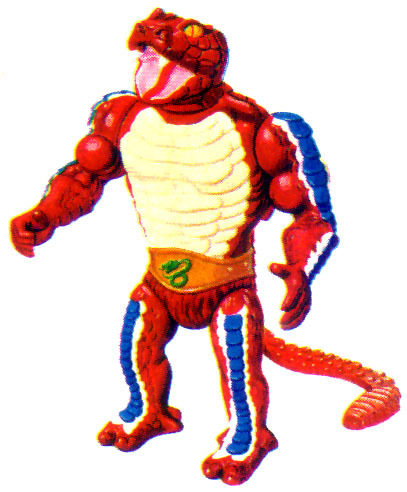 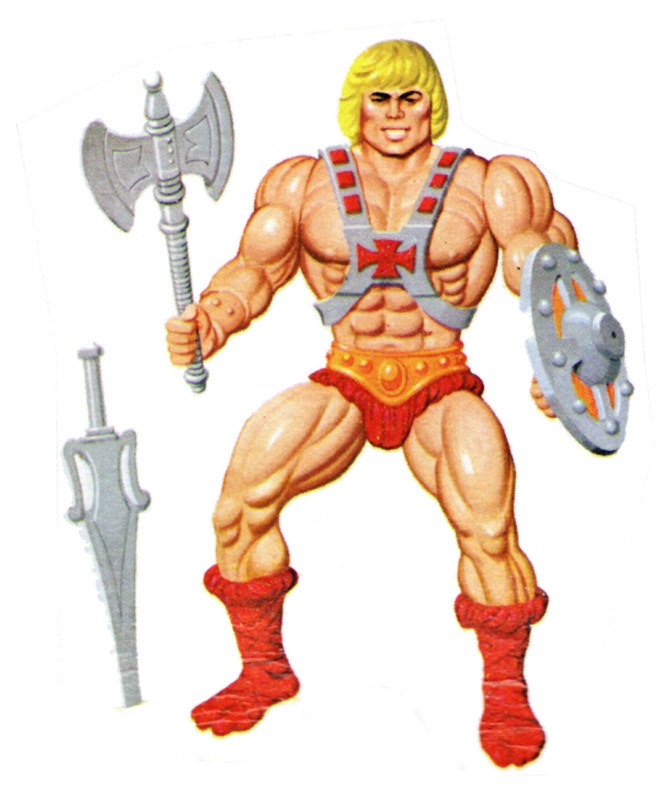 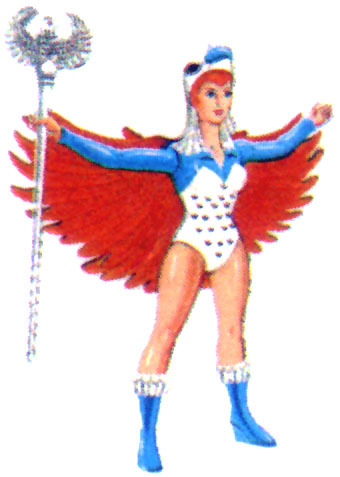 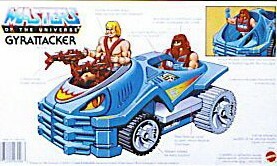 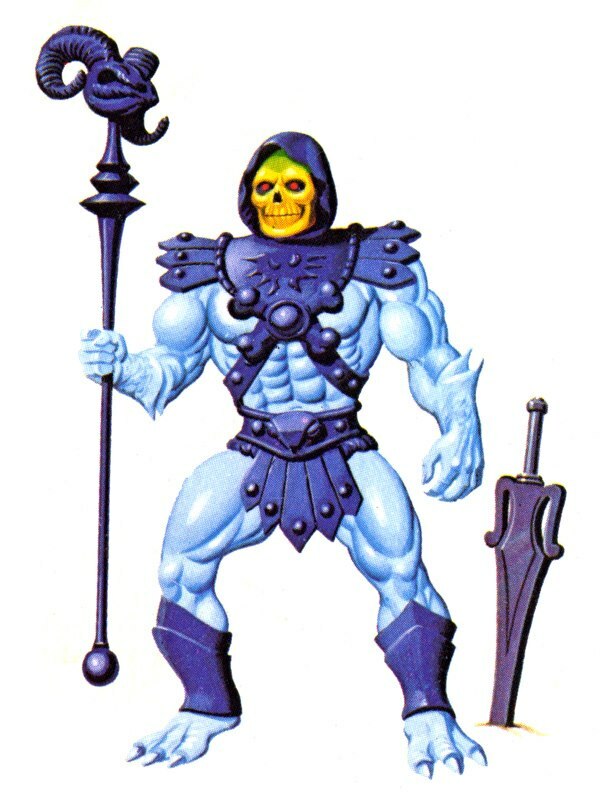 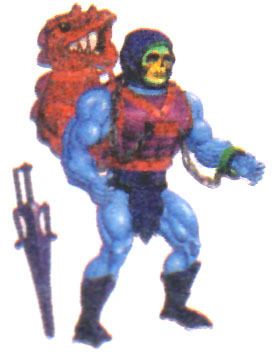 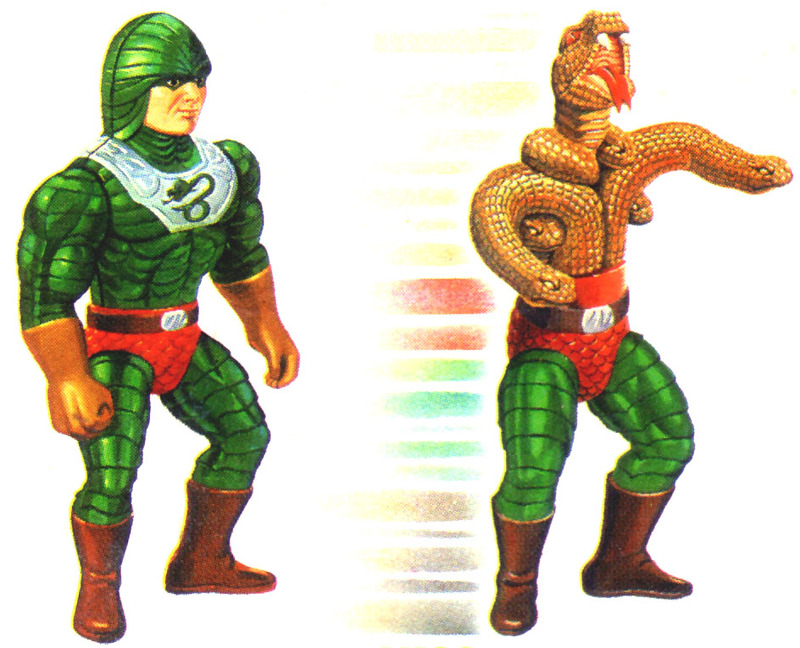 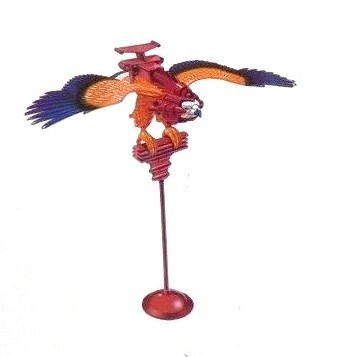 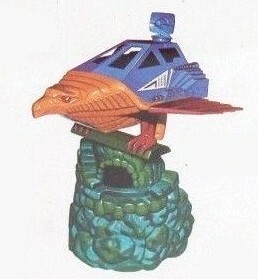 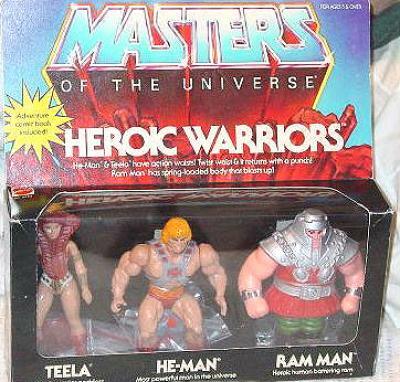 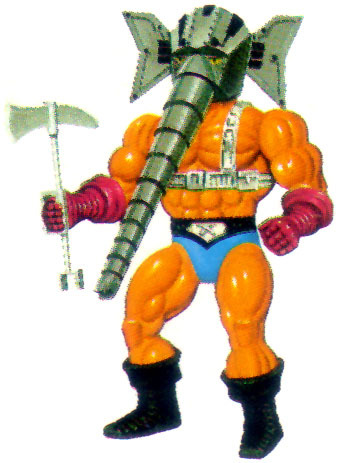 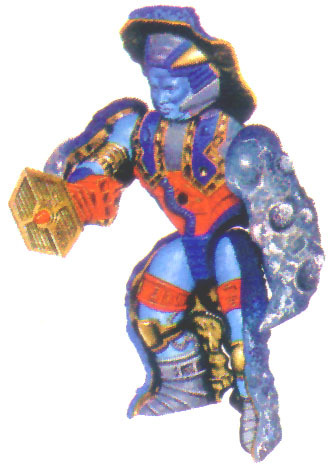 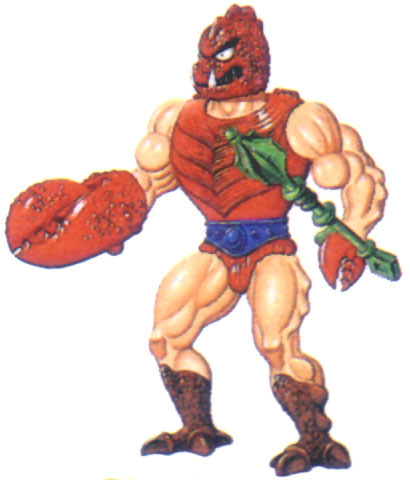 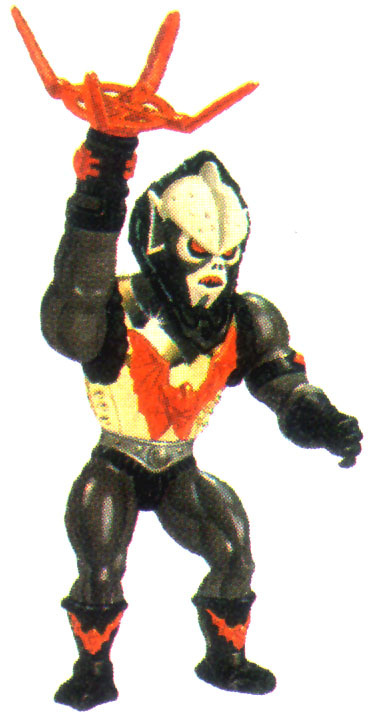 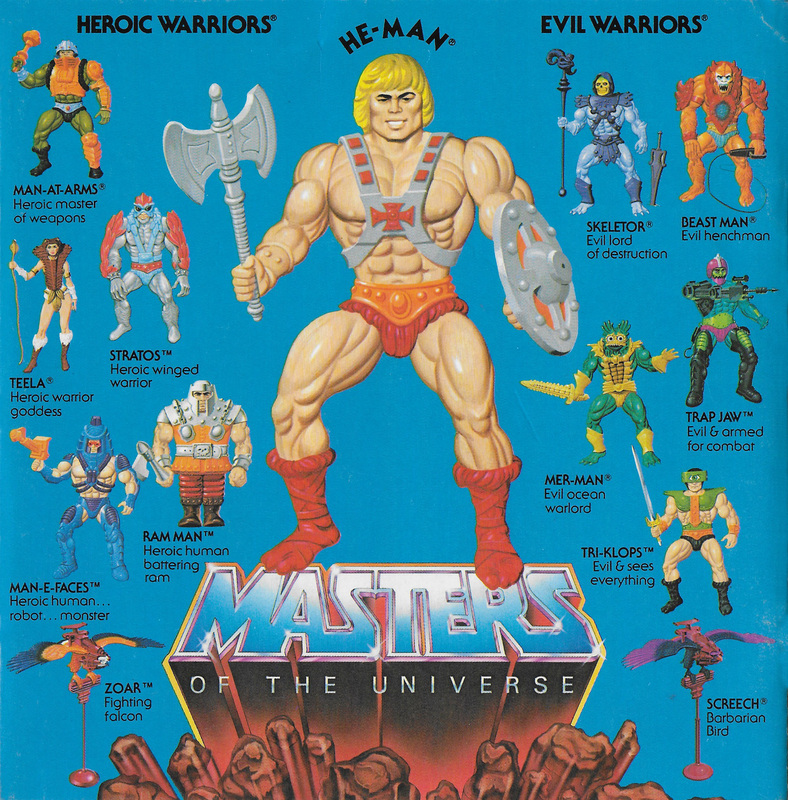 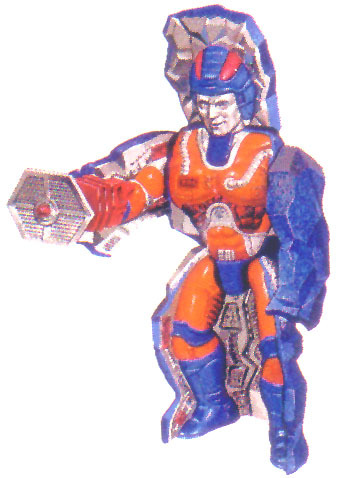 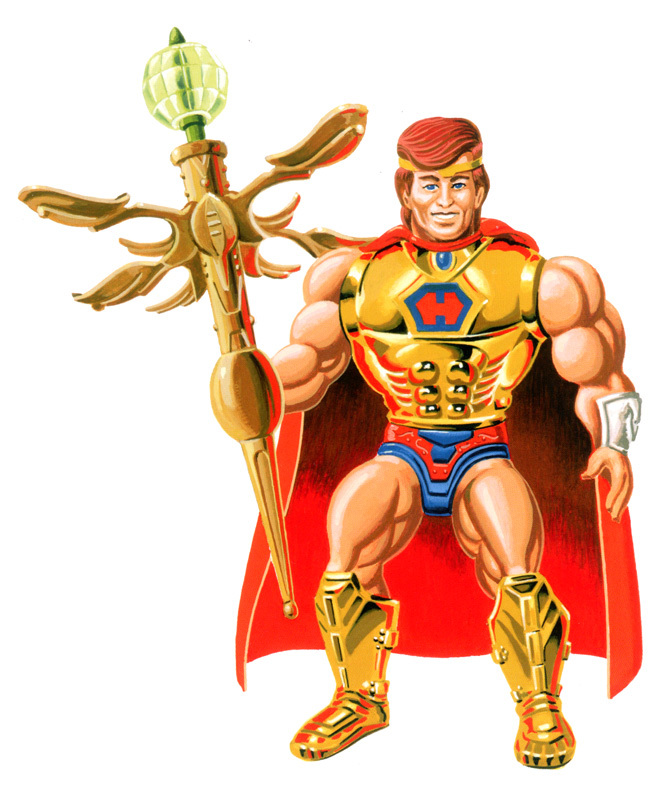 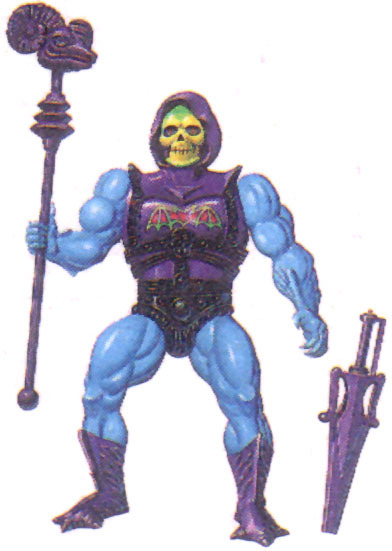 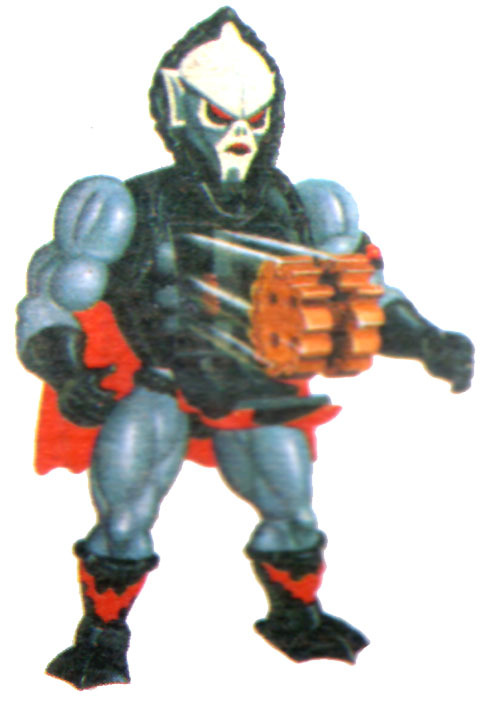 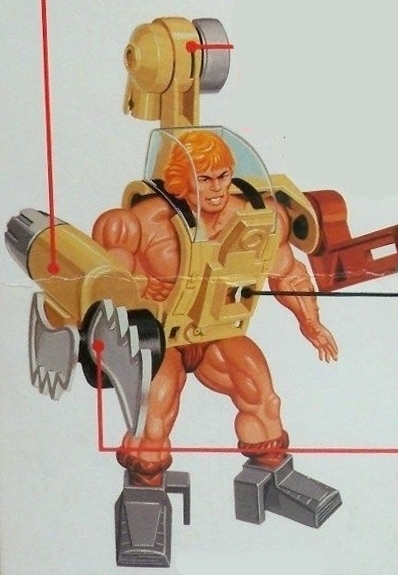 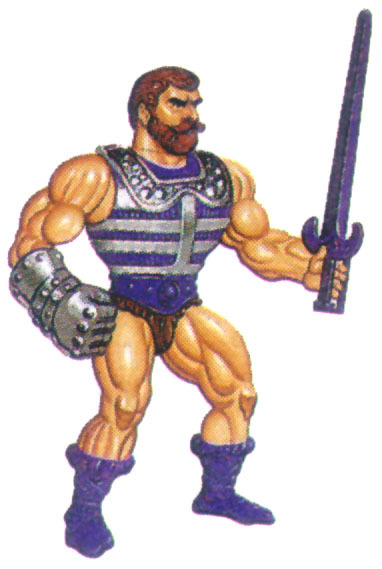 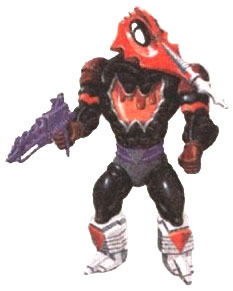 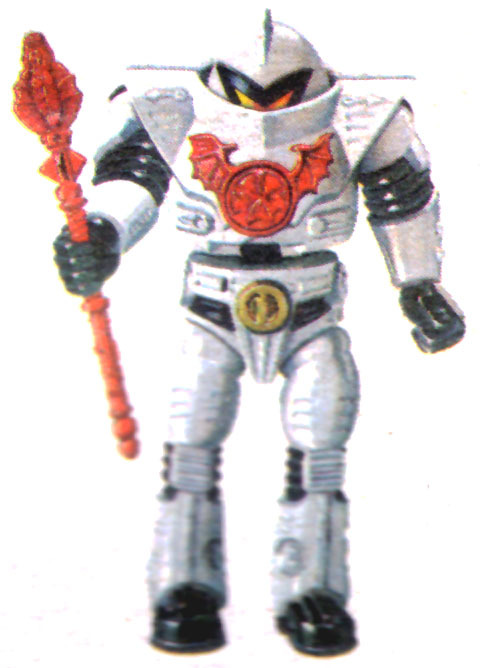 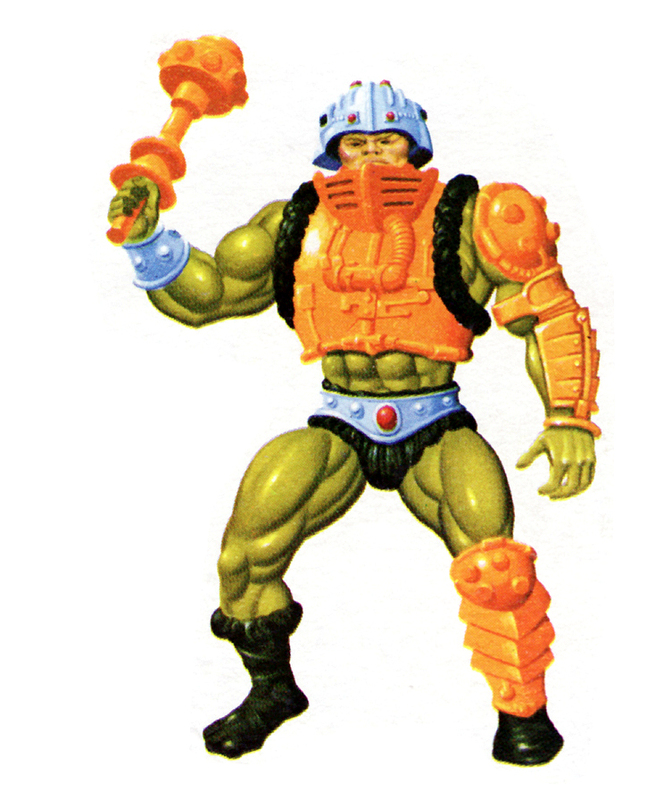 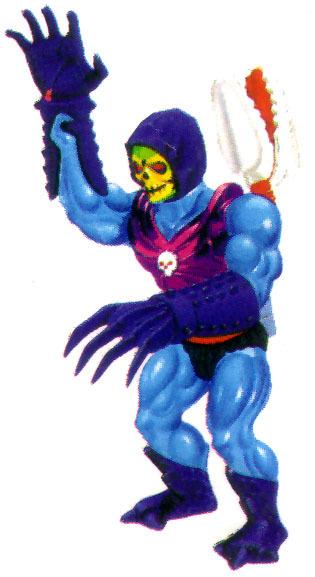 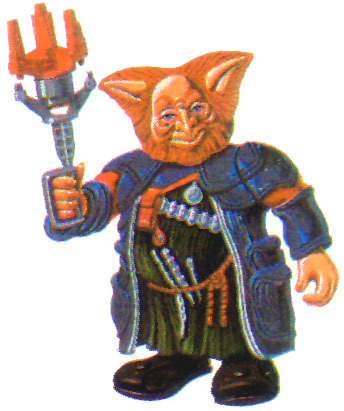 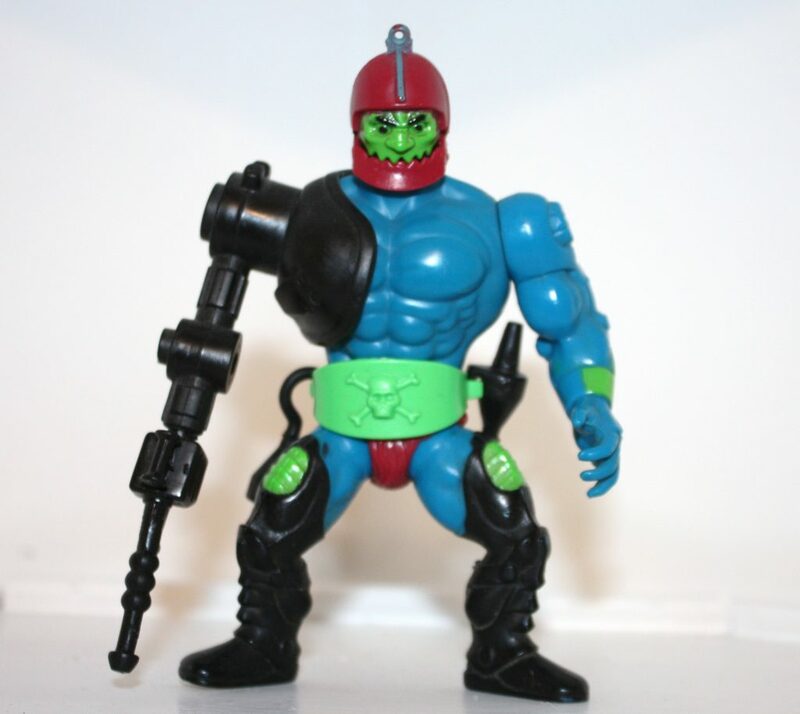 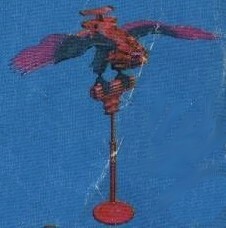 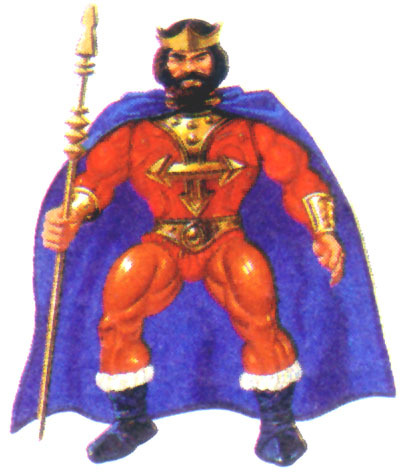 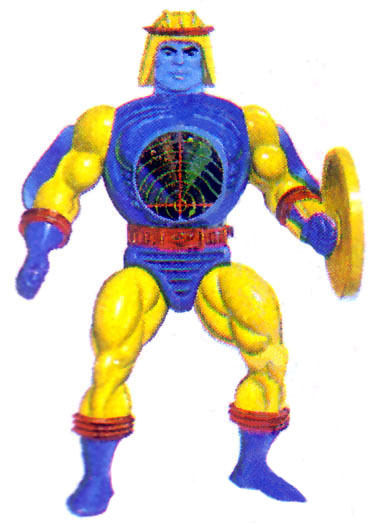 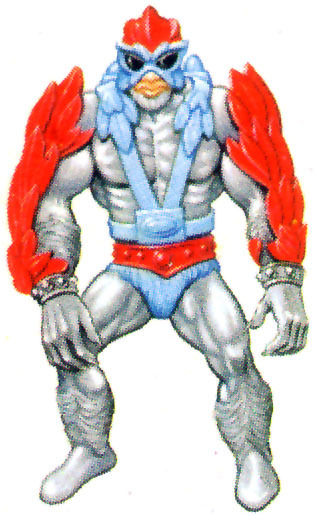 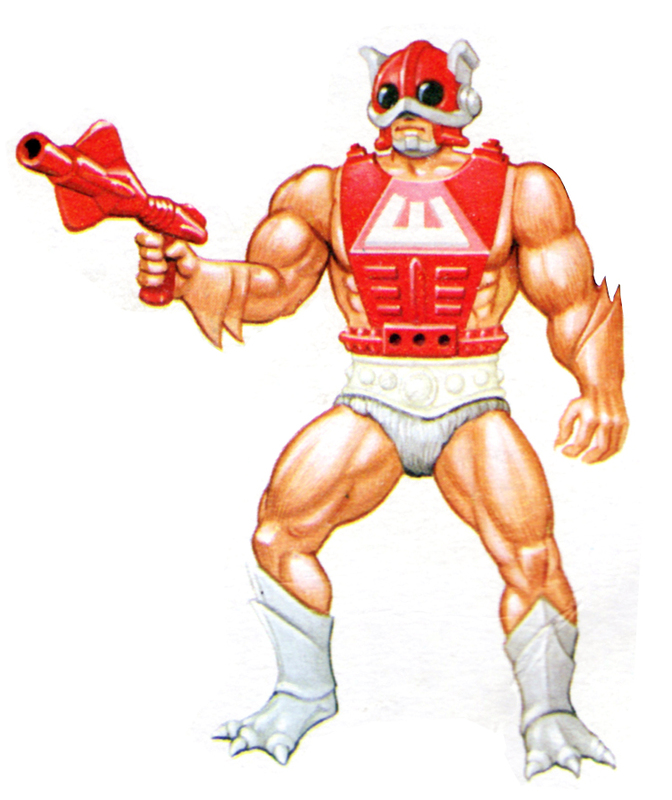 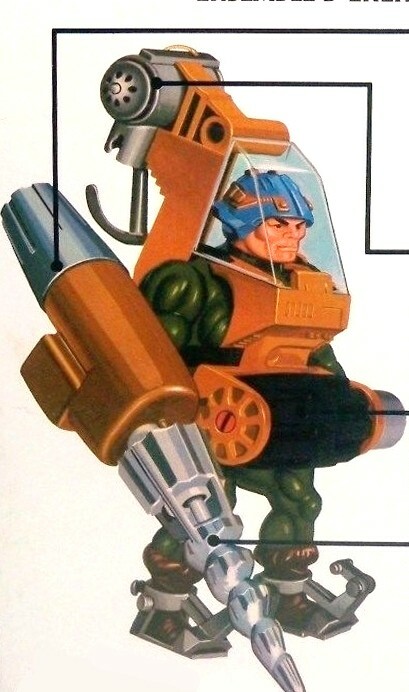 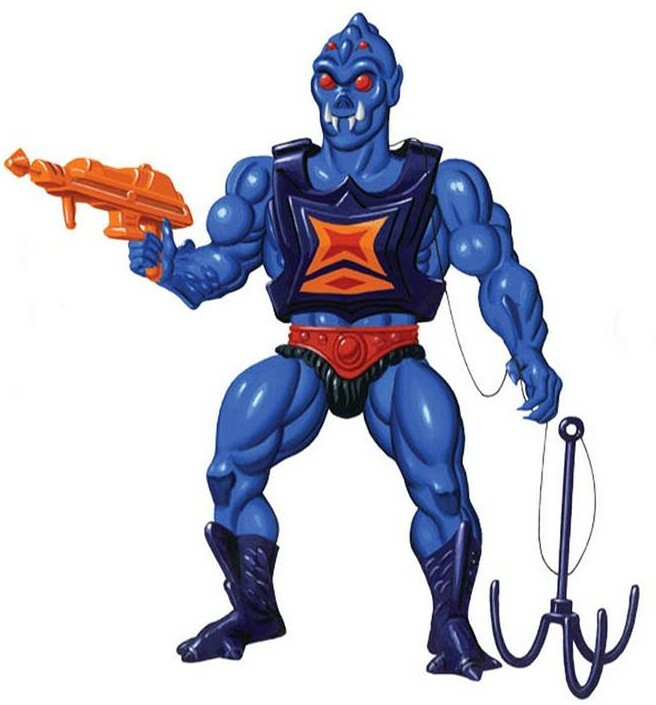 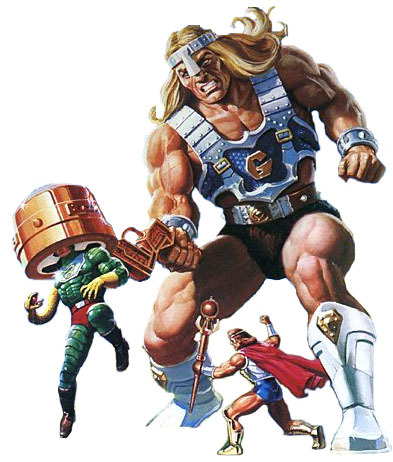 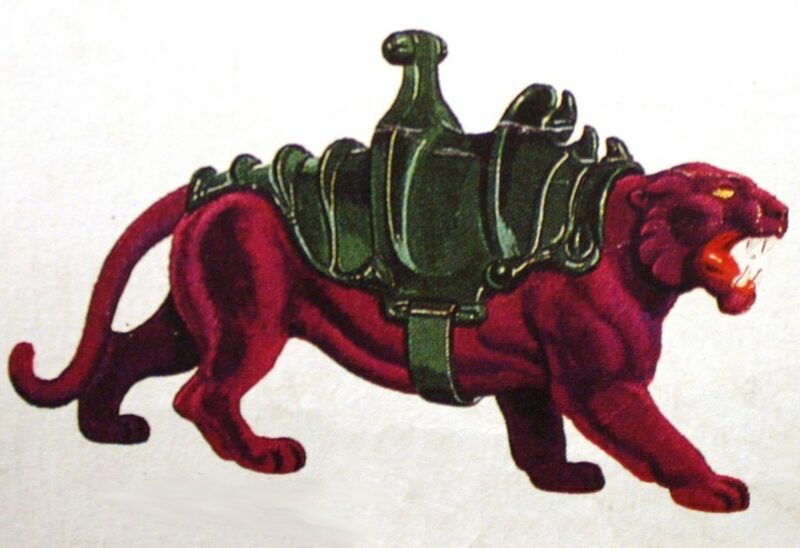 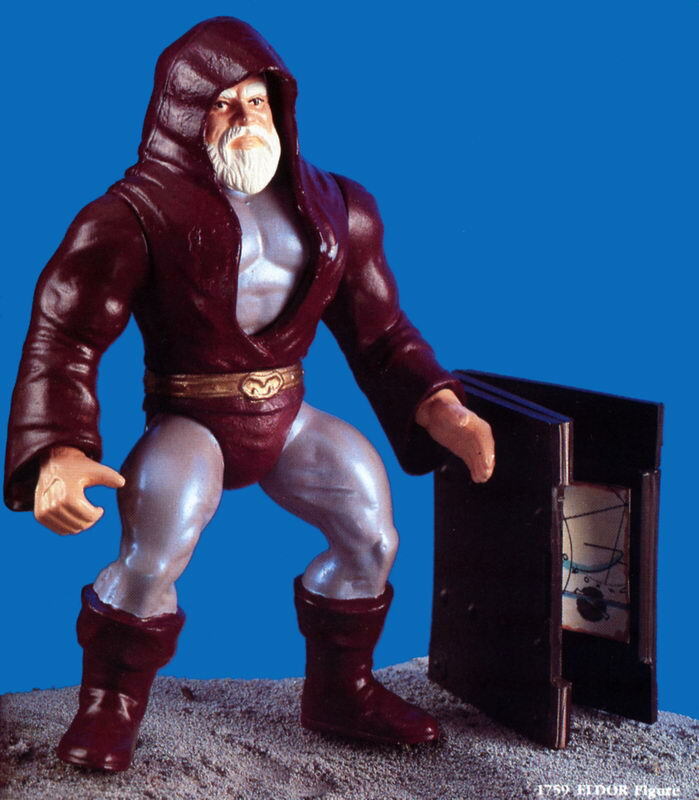 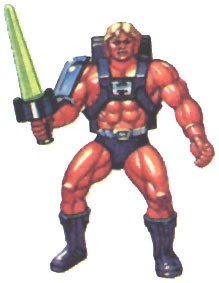 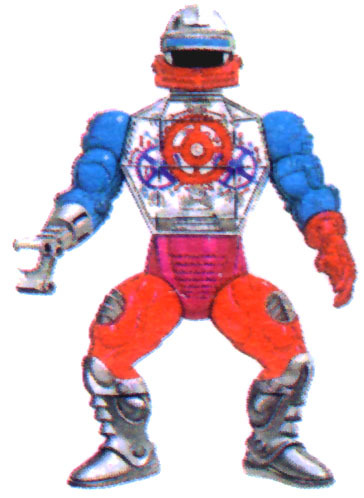 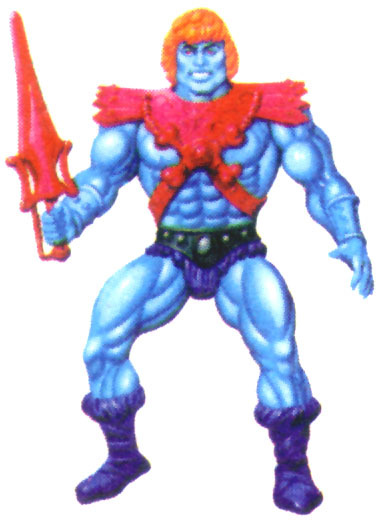 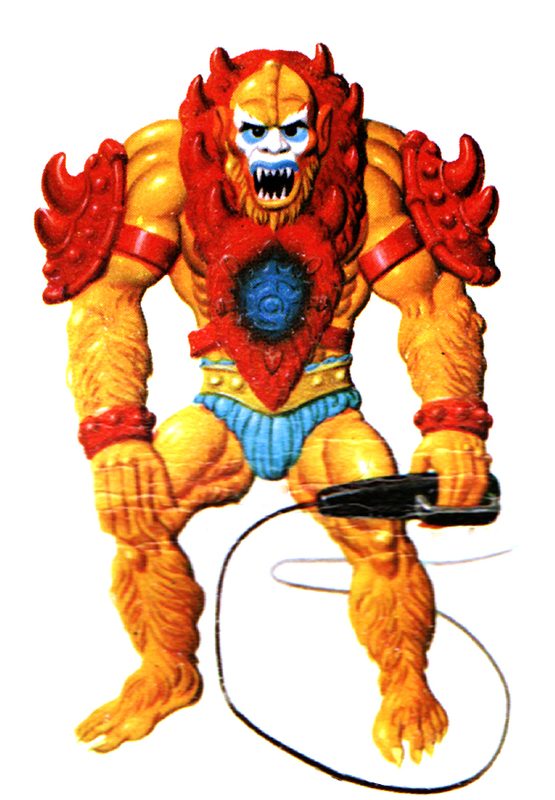 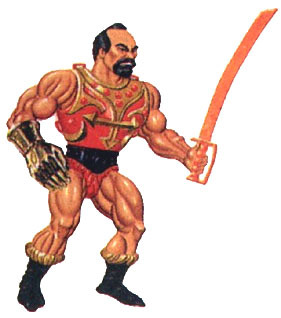 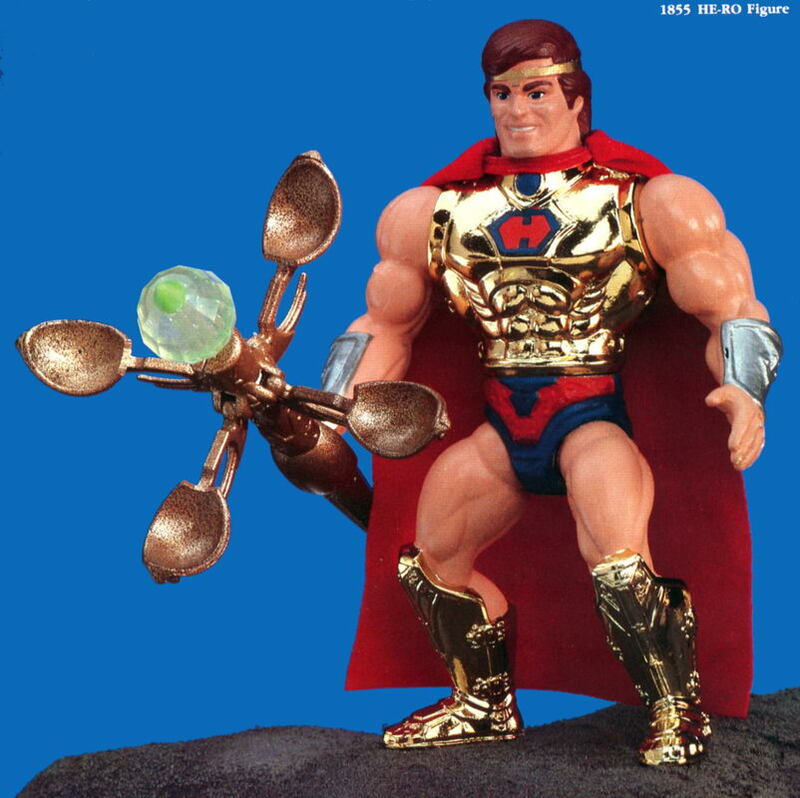 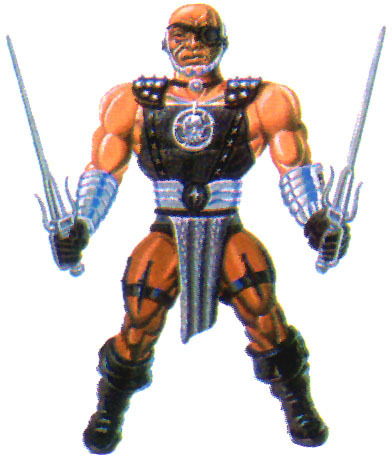 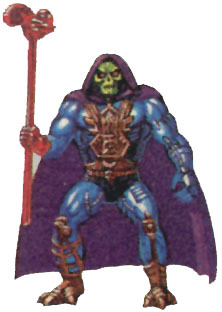 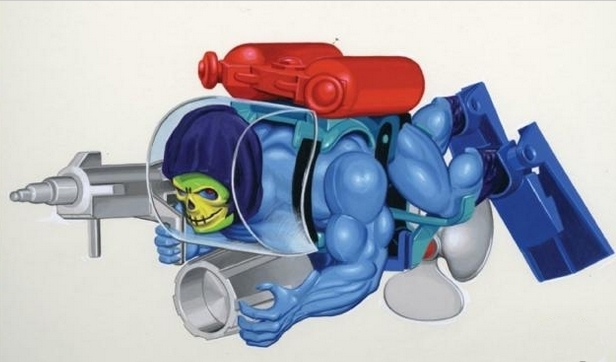 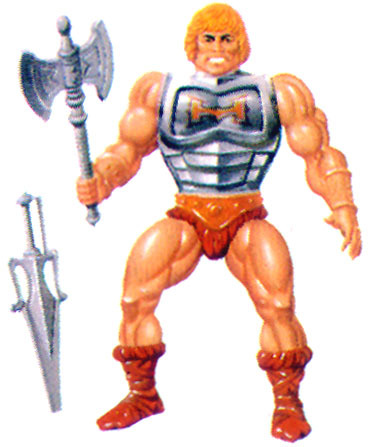 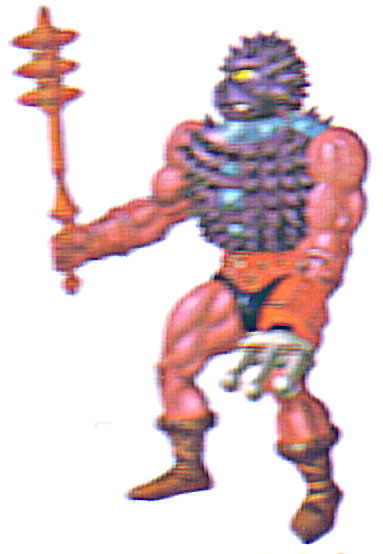 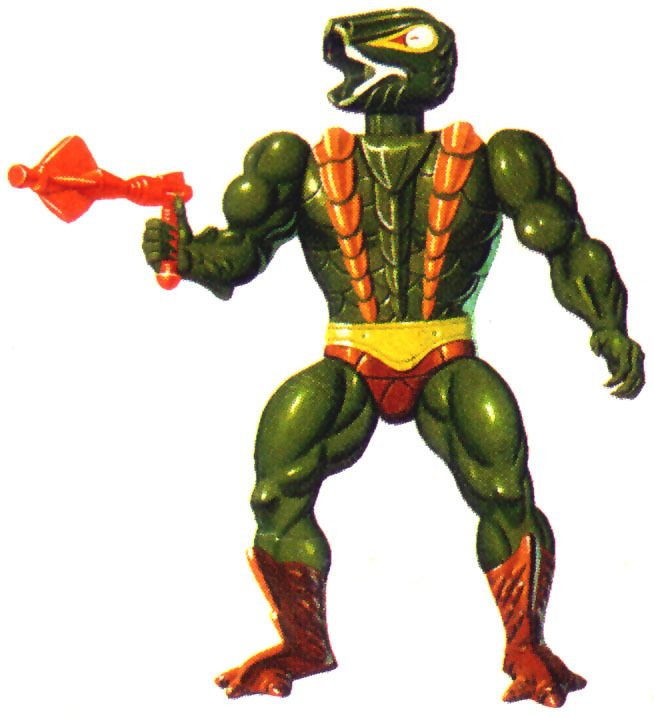 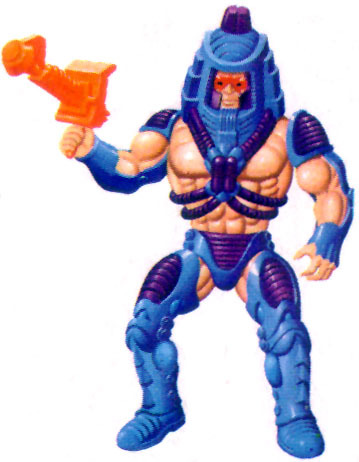 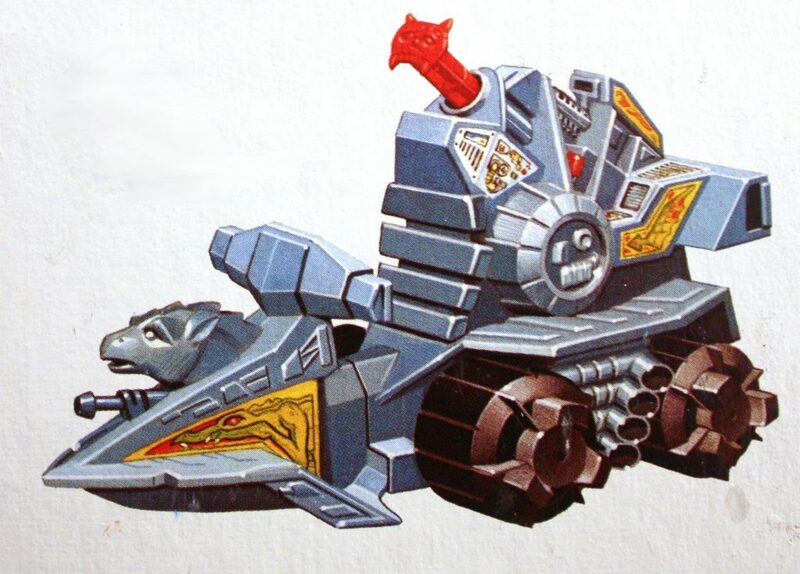 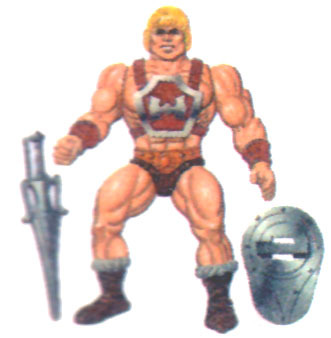 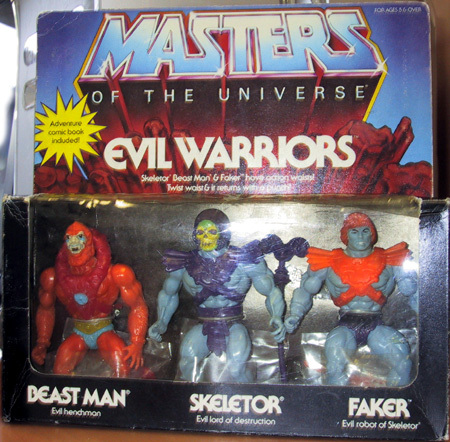 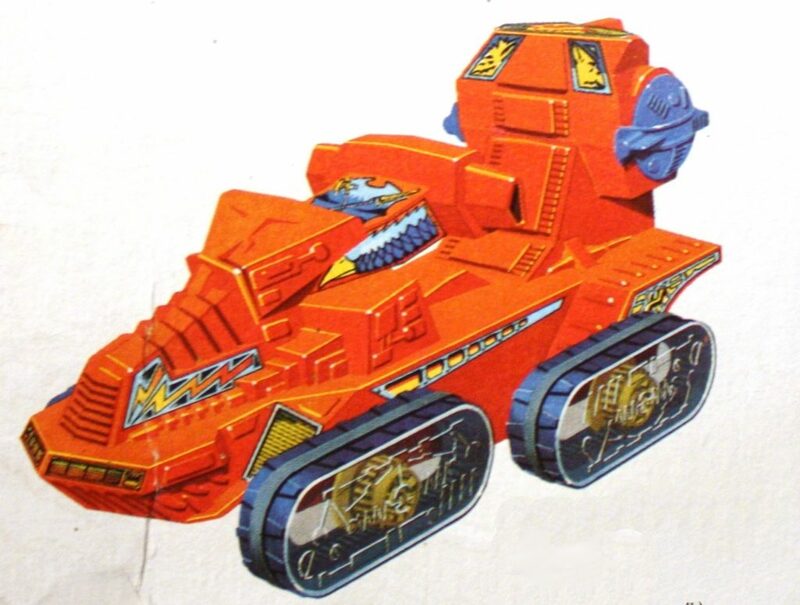 In this prototype he has been given He-Man’s left arm, painted blue. 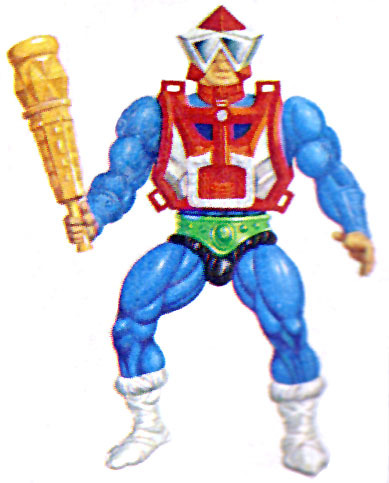 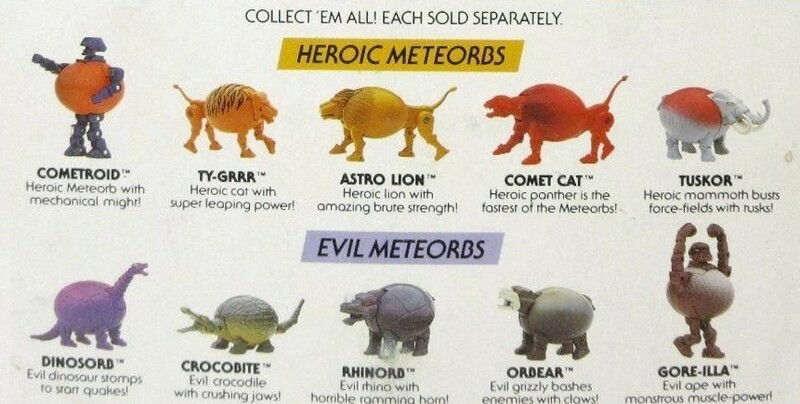 He also sports Man-E-Faces’ legs. 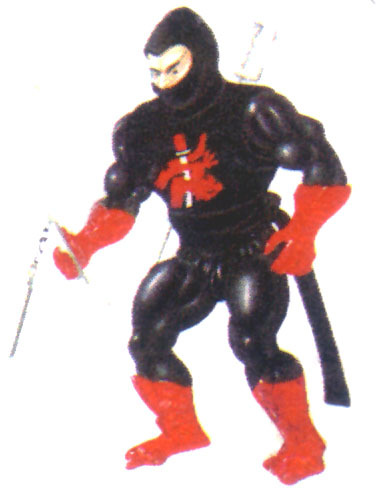 The boots are painted black, with green accents (the feet are somewhat smaller than the final design, however). 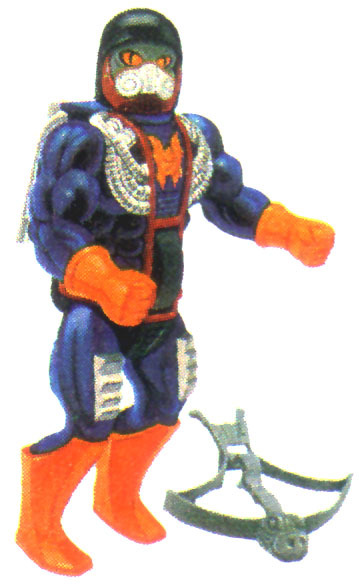 His belt features rivets around the edges, but it’s unclear from the image if there is a design in the center. 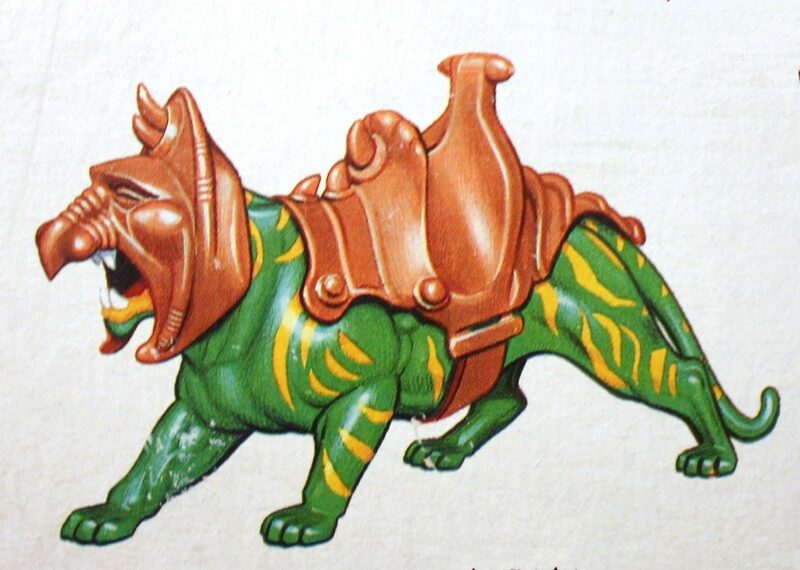 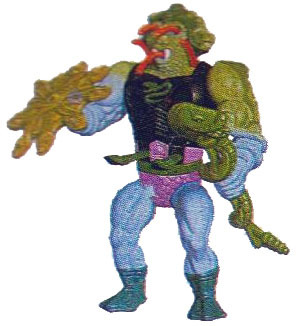 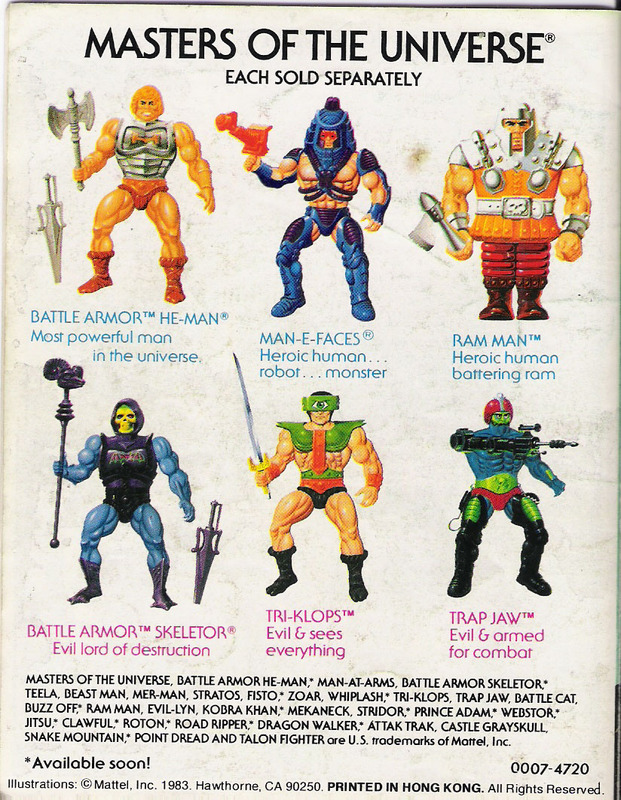 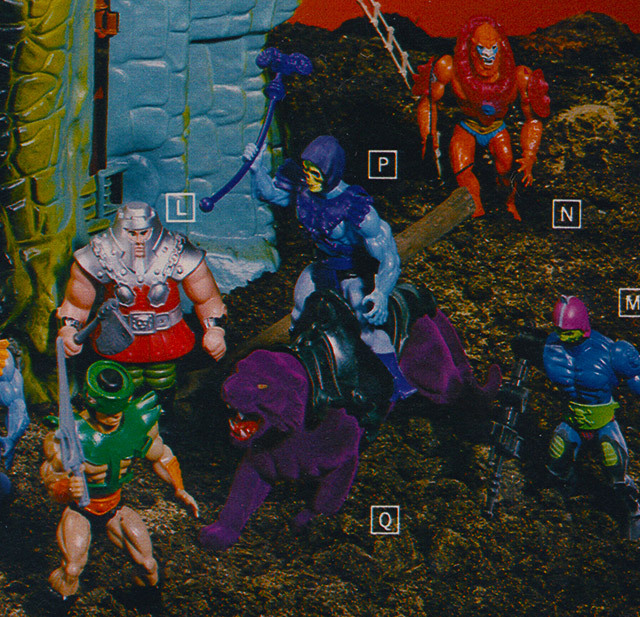 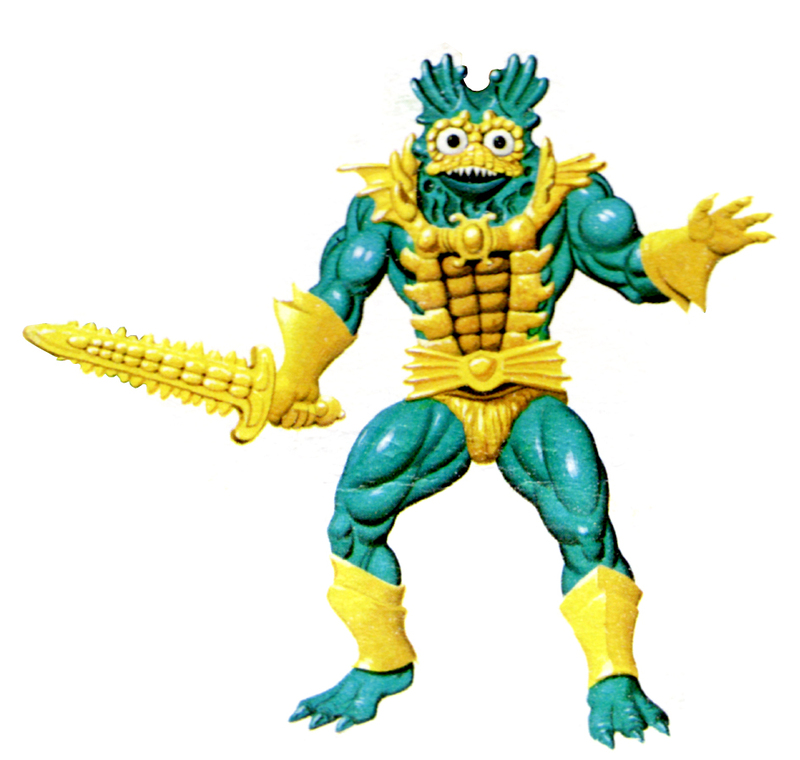 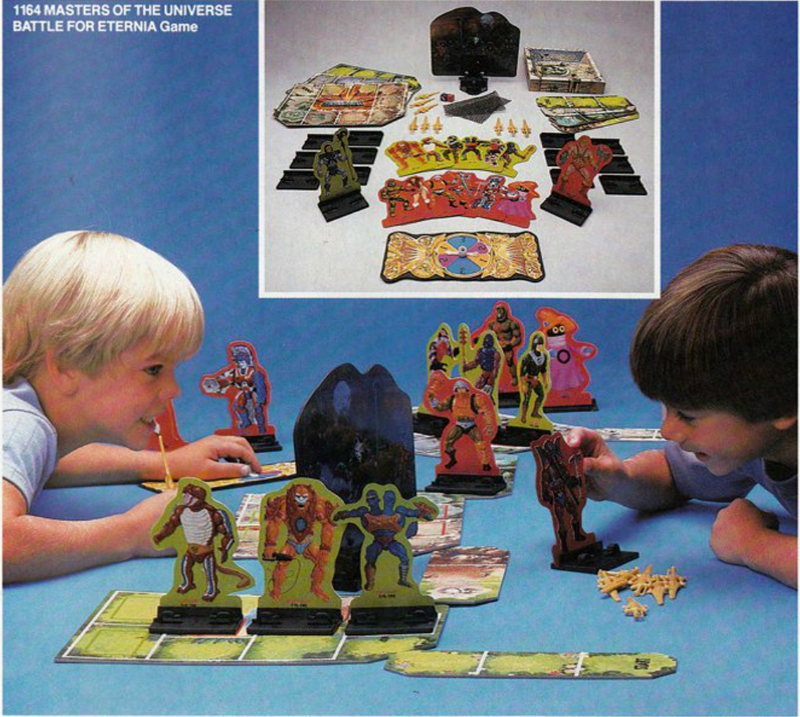 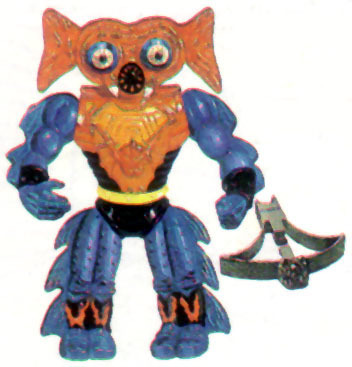 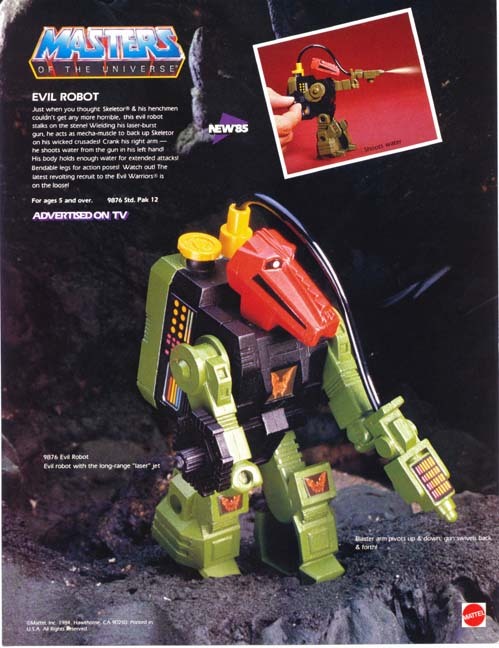 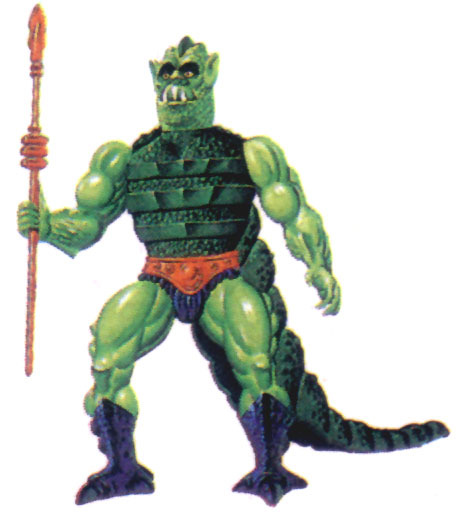 Interestingly, Trap Jaw showed up in precisely this condition in the 1983 Consumers Catalog (below). 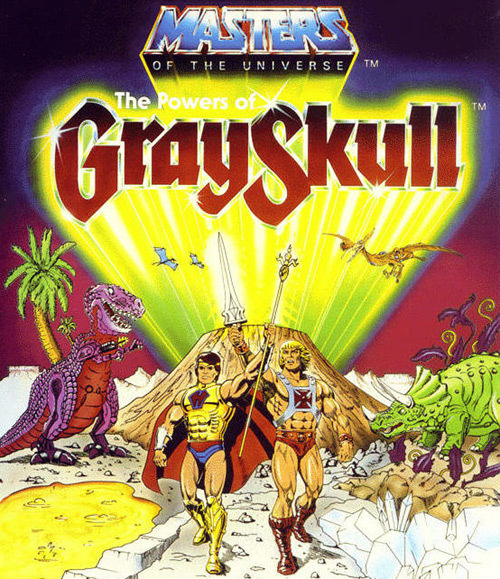 I wonder if that error lead to the error in the above version of the cross sell artwork. 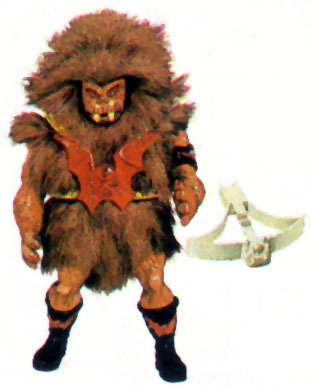 The final figure is slightly different from the prototype. 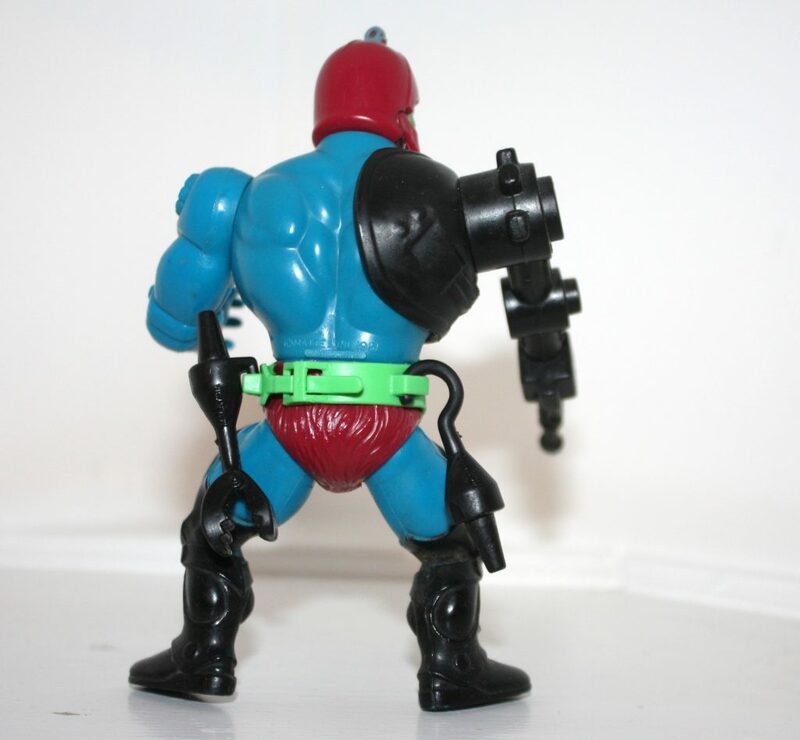 Trap Jaw’s belt features a skull and cross bones in the center area, but lacks the rivets of the prototype. 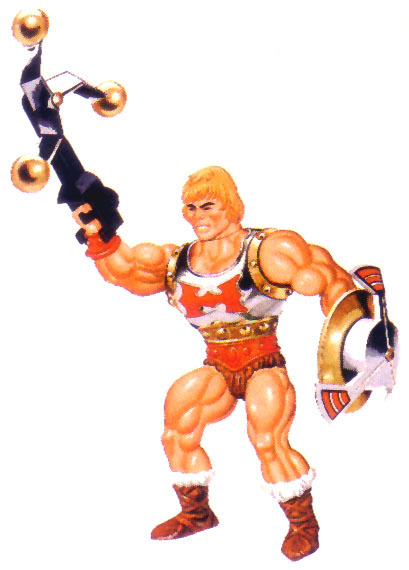 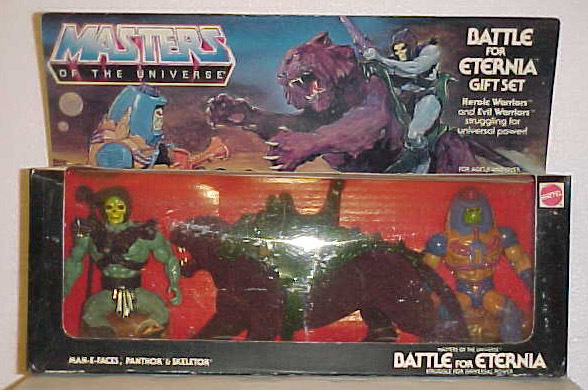 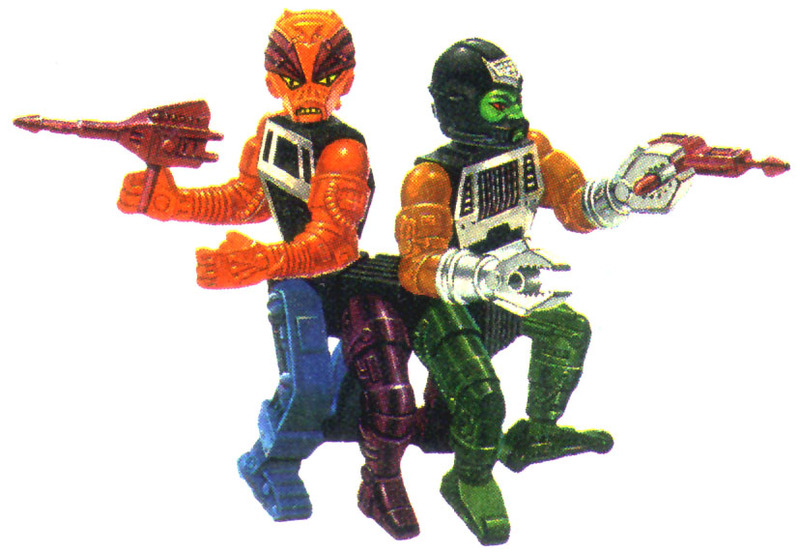 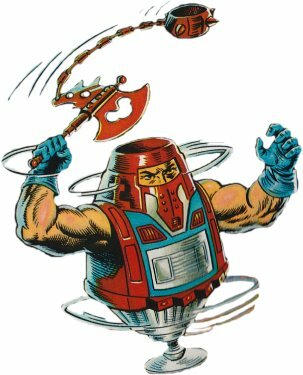 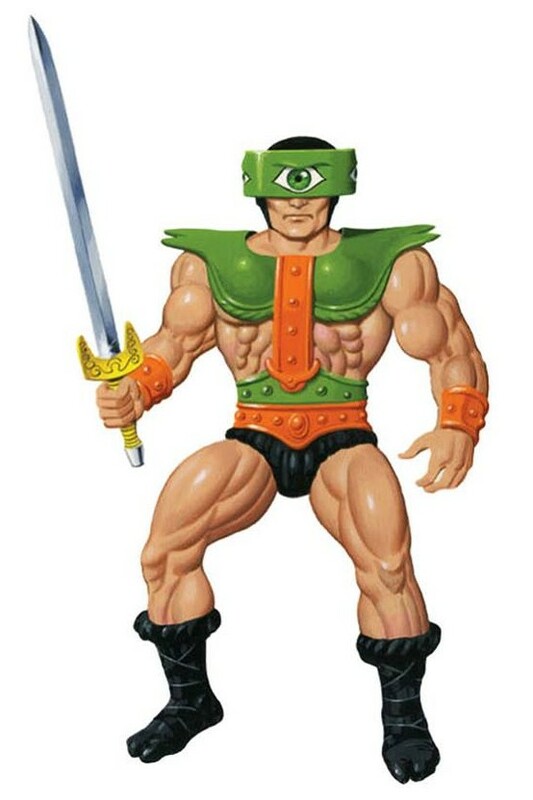 Also, rather than reusing He-Man’s left arm, the final figure utilizes a modified version of Man-E-Faces’ left arm, with some changes made to the design of the shoulder, forearm, and back of the hand. 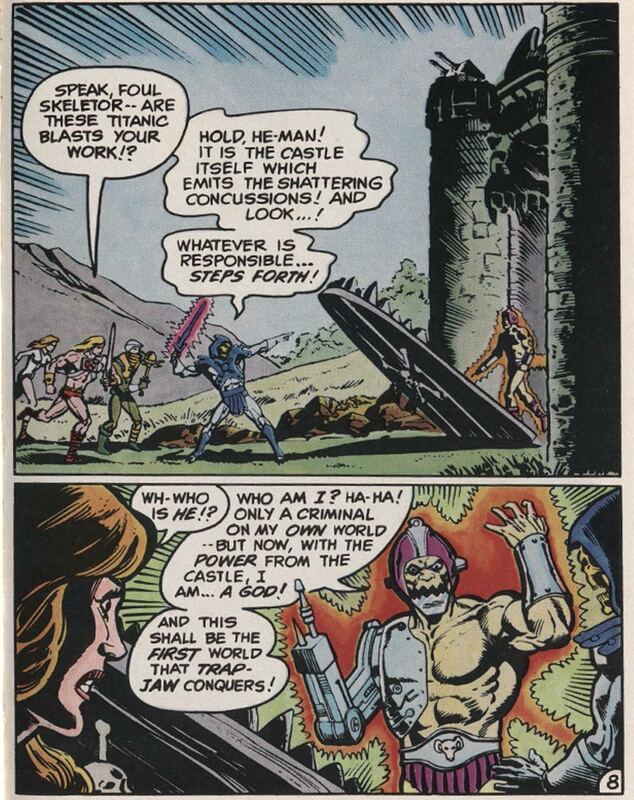 In the afore-mentioned mini comic, Trap Jaw is portrayed as a ruthless criminal. 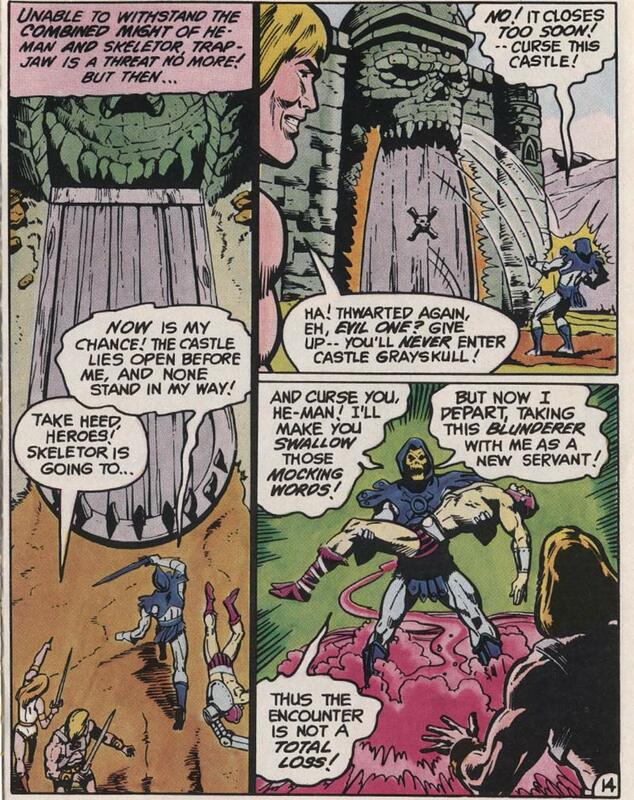 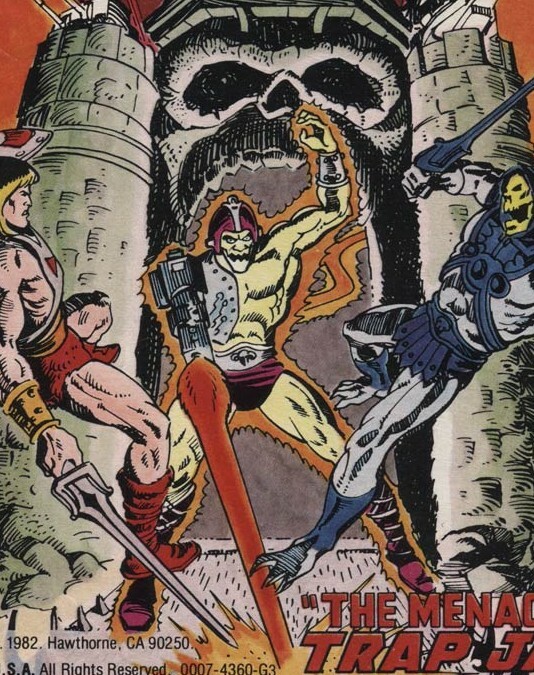 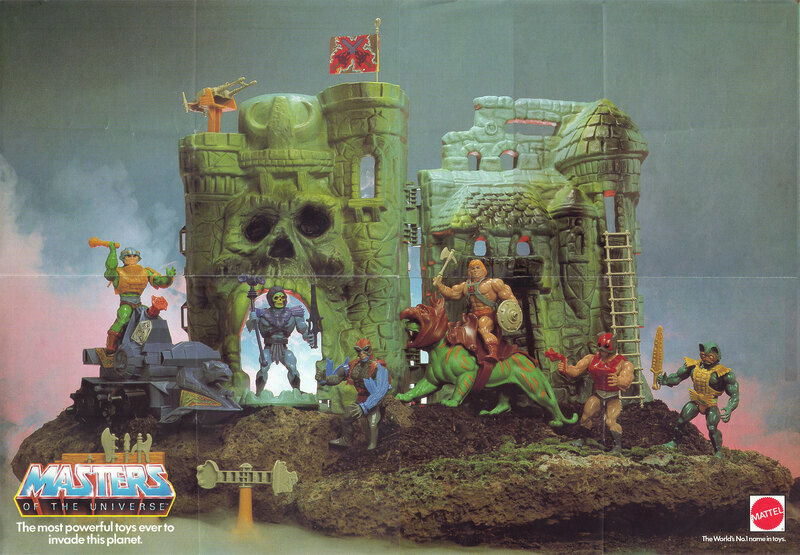 Accidentally brought to Eternia by Skeletor, Trap Jaw manages to harness the power of Grayskull, and can only be taken down by the combined forces of Skeletor and He-Man. 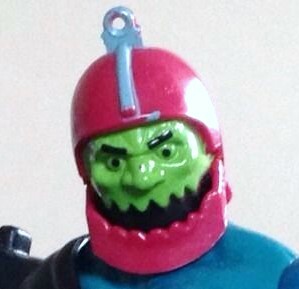 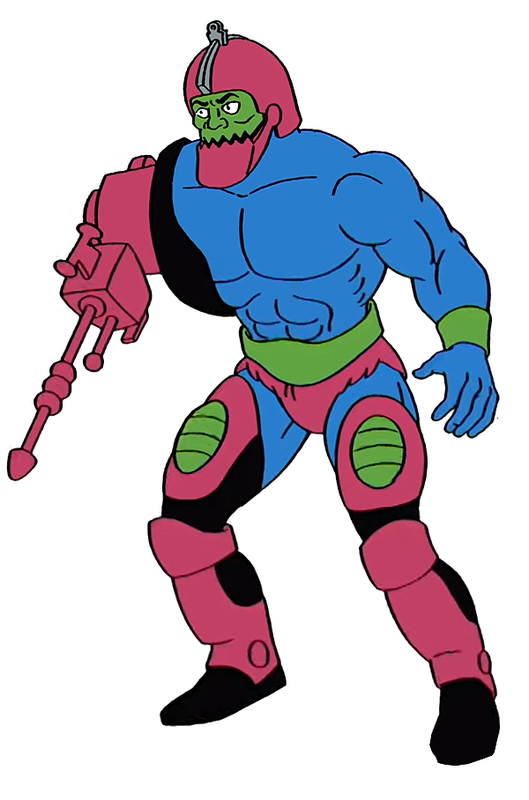 In the Filmation cartoon, Trap Jaw is a bumbling and almost lovable henchman of Skeletor. 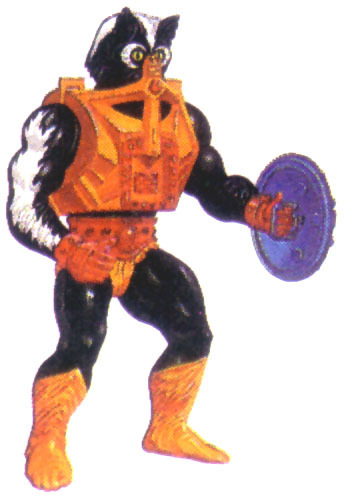 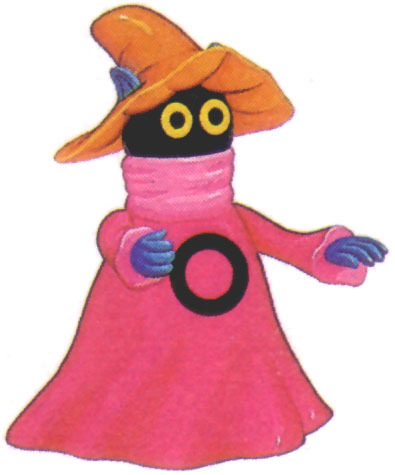 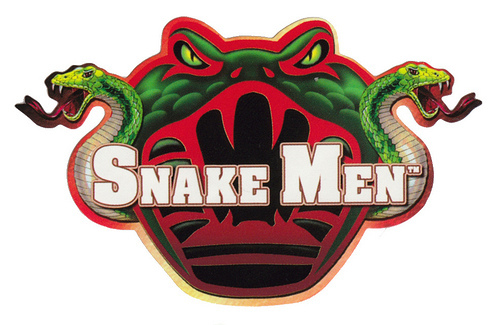 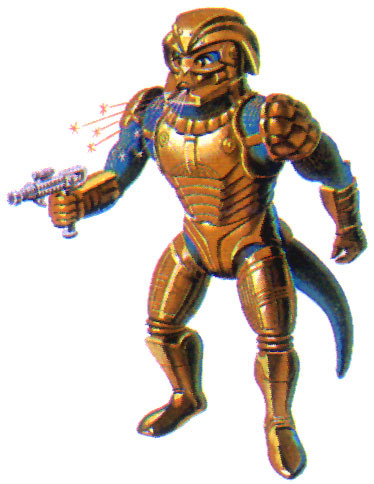 Dubbed “the wizard of weapons”, he is also the mechanic and engineer of Snake Mountain. 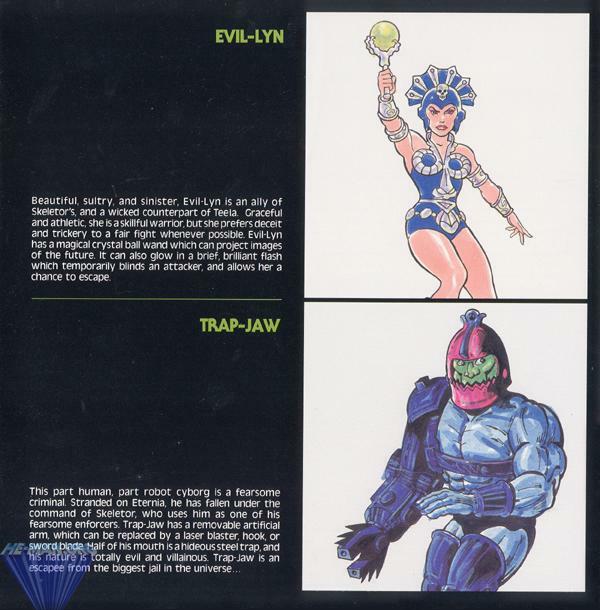 However, in the actual cartoon the chosen design was a simplified version of the prototype version of Trap Jaw. 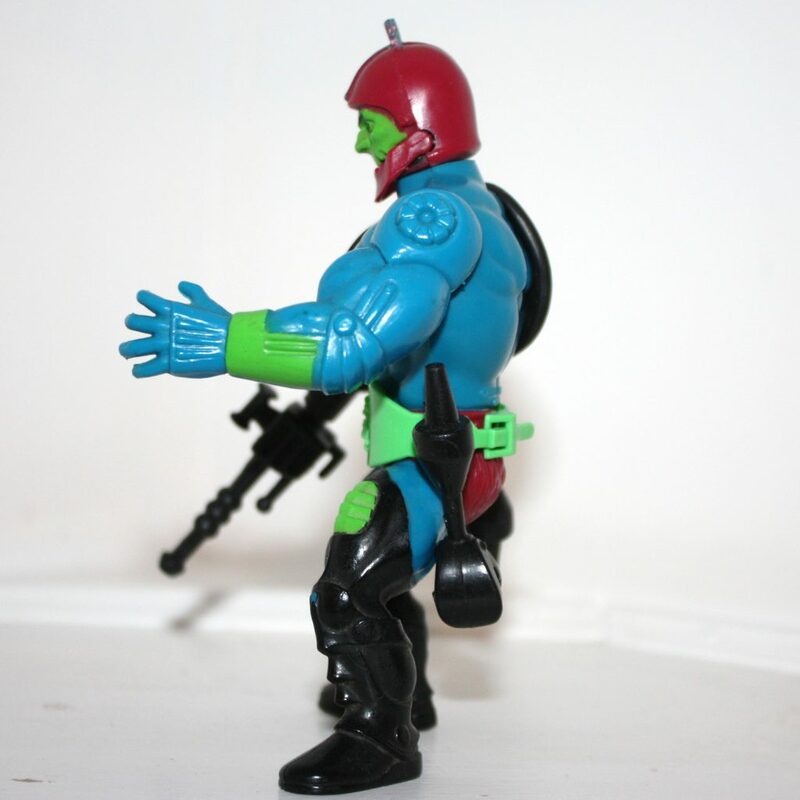 One obvious difference from the prototype version is that his boots and mechanical arm are colored the same maroon color as his helmet and jaw. 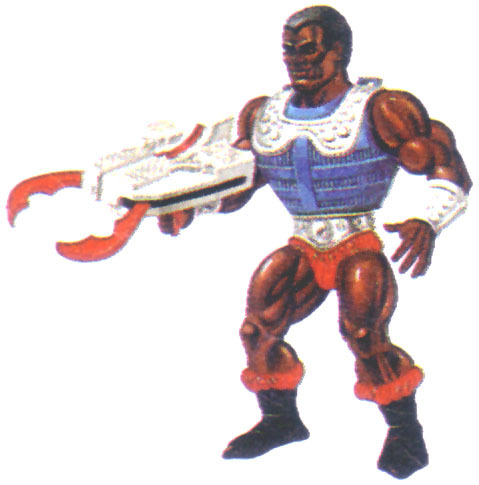 I would guess the change was made to make the lines of his weapons and boots more visible, without the need for shading. 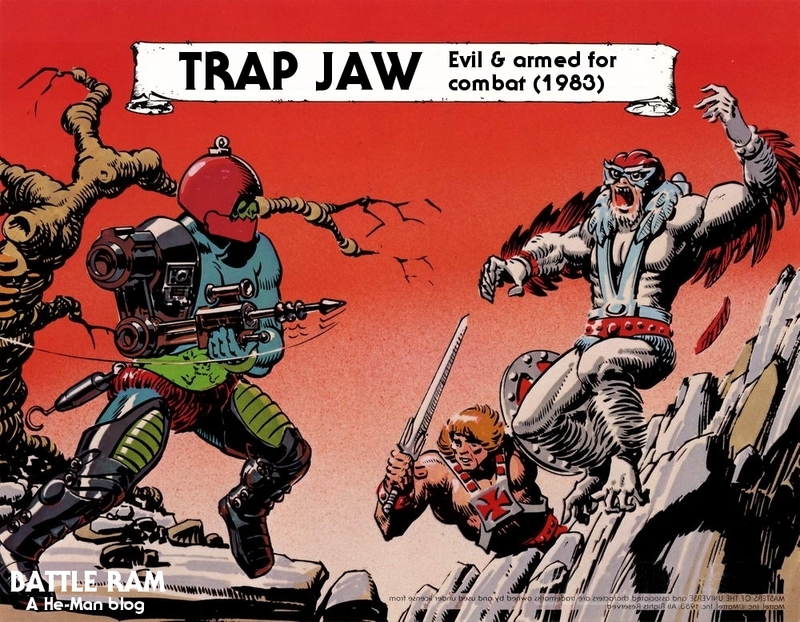 TRAP JAW – part human, part robot, he’s a fearsome criminal stranded on Infinita and fallen under the command of Skeletor. 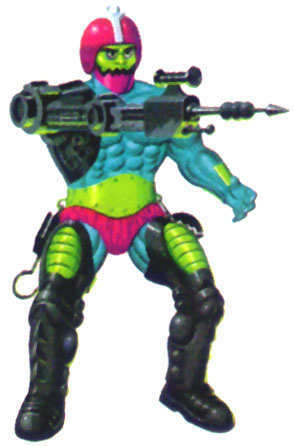 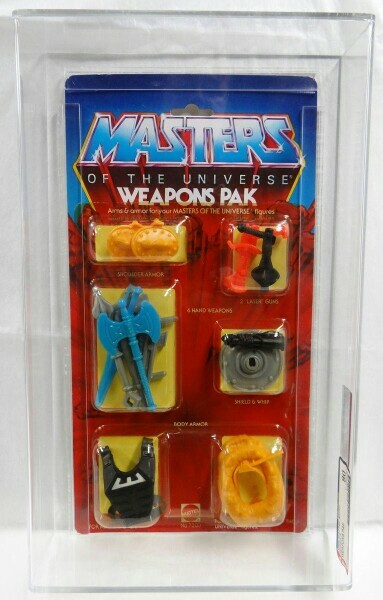 Trap Jaw has a removable artificial arm which can be replaced by a laser blaster, hook sword or other devices of evil. 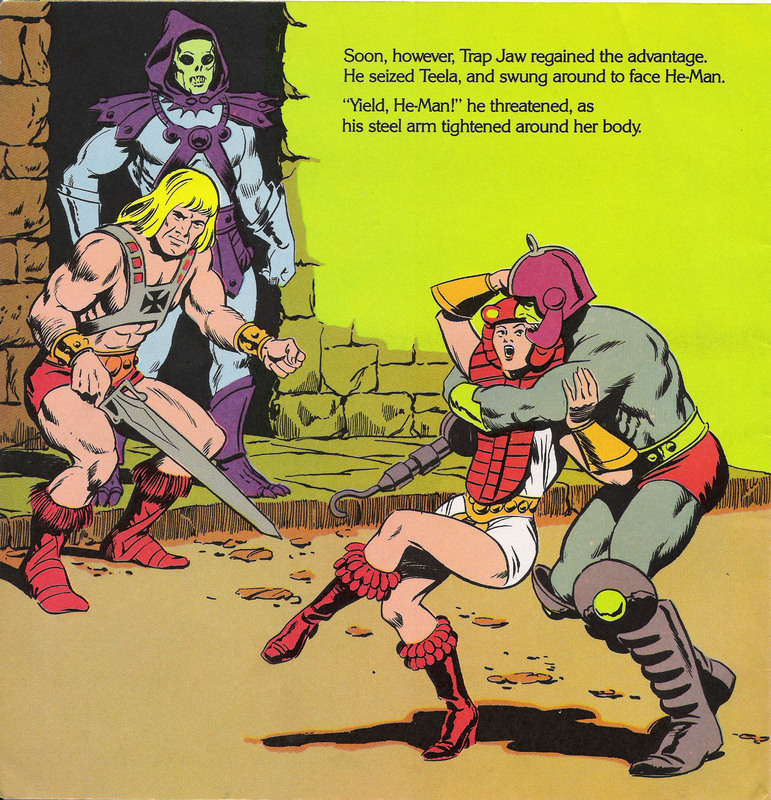 Sometimes he isn’t fast enough to make the change and then He Man or his friends get the better of the vicious criminal. 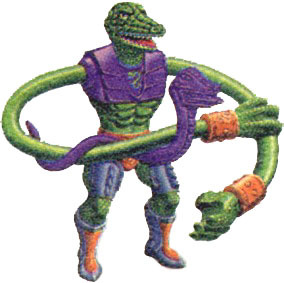 His jaw is a hideous steel trap which can chew through almost anything and he’s totally evil and villainous. 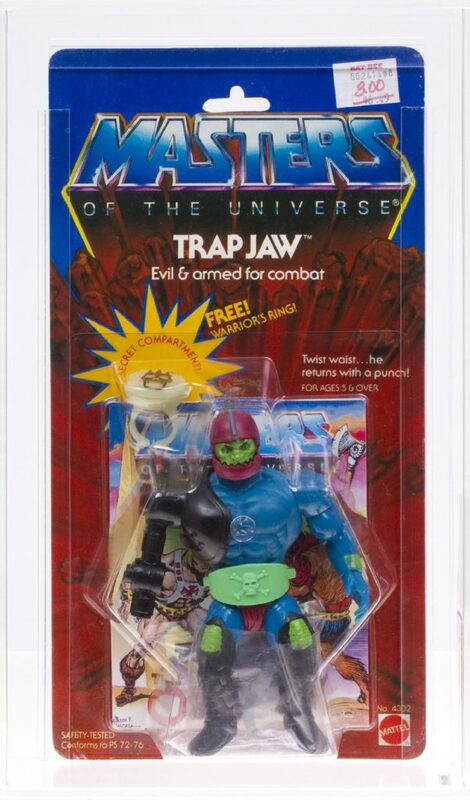 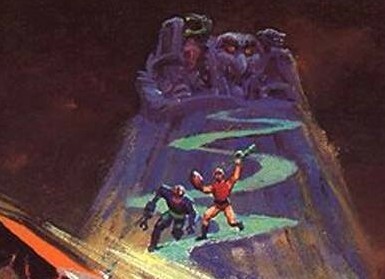 Trap Jaw remains one of the most beloved characters of the MOTU mythos. 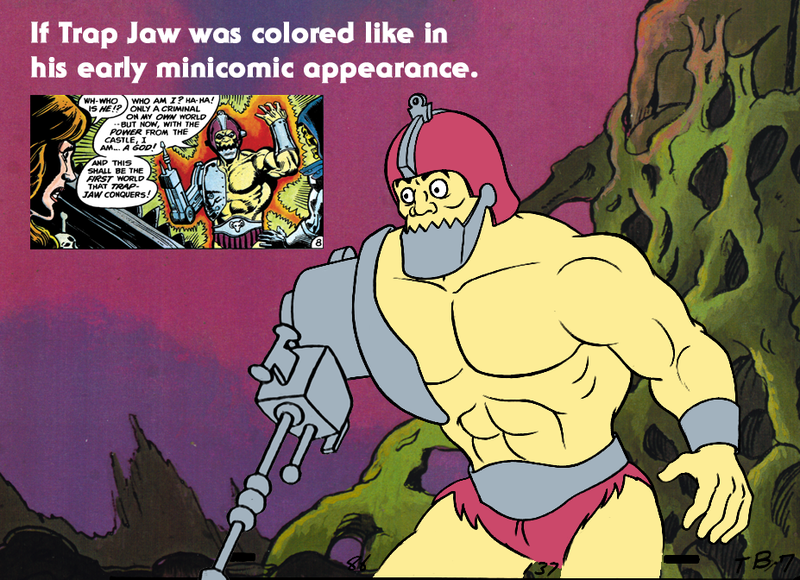 Part pirate, part Bond villain and part barbarian cyborg, Trap Jaw is truly greater than the sum of his bionic parts. 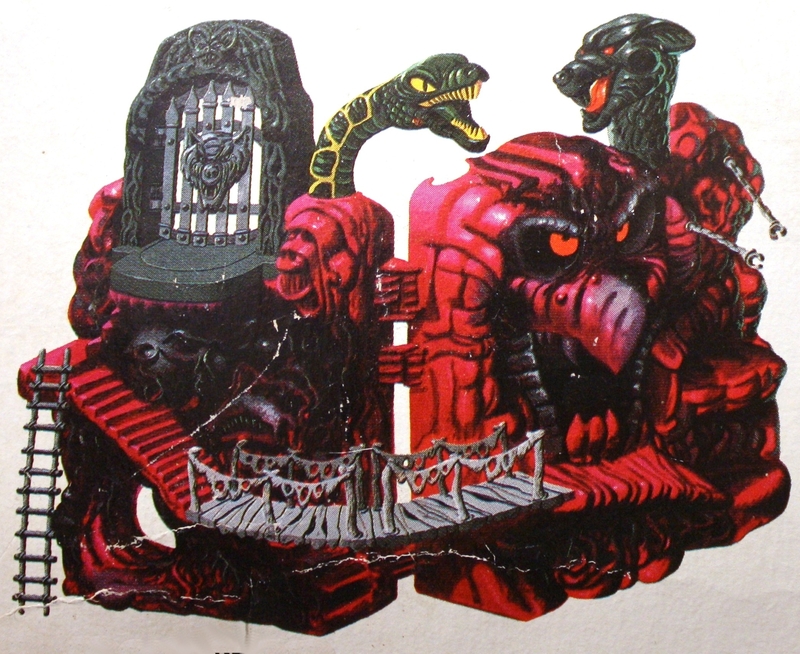 Artwork by Errol McCarthy. 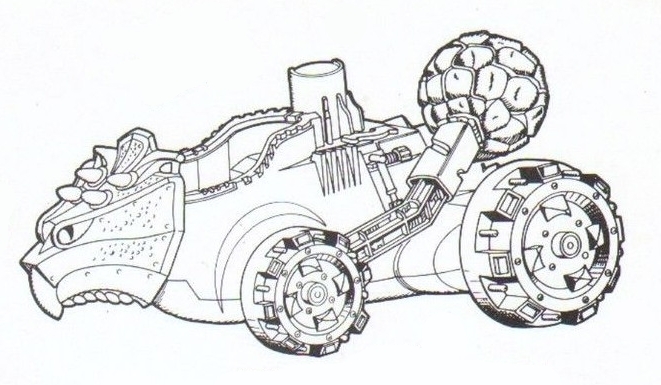 Image courtesy of Jukka Issakainen.